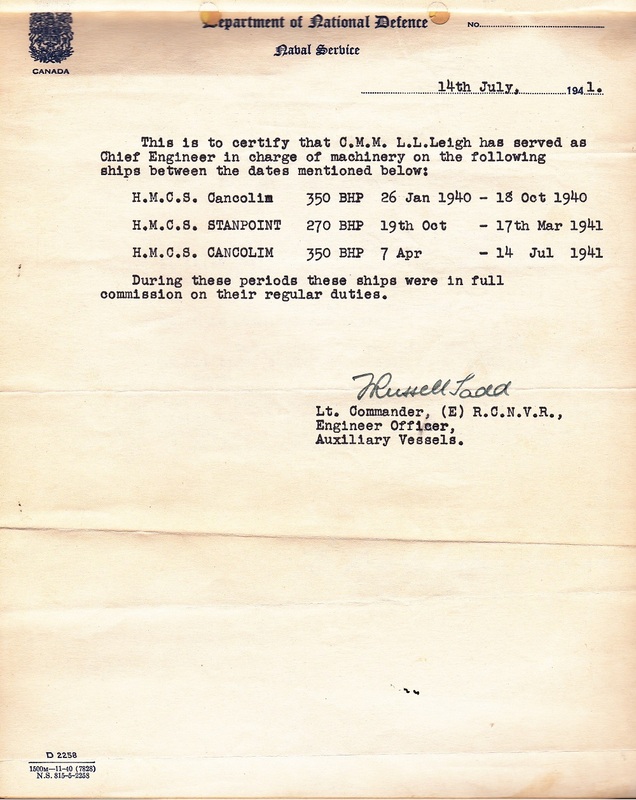 SPARK, Gerald Gibson, C1ST, RCN - Another sailor has crossed the bar. He went suddenly, on June 10, 2000, while carrying the Cutlass in the Esquimalt Buccaneer Day Parade. Predeceased by his parents, sister, Maude and brother, Joe. Gerry was born on St. Patrick's Day, March 17, 1920, in Victoria, B.C. Survived by his wife, Norah; son, Murray (Candy); granddaughters, Alicia and Jennifer; sister, Lucille "Lou" Fraser; sister-in-law, Betty Spark; and many nieces and nephews. 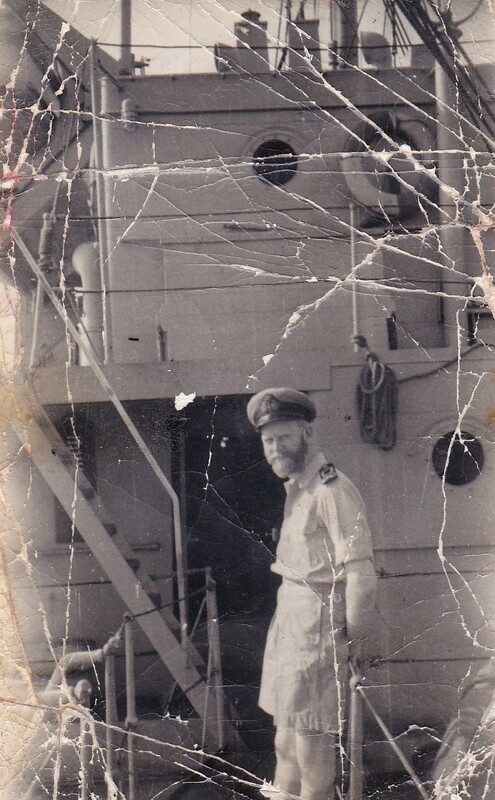 He served in the RCN, retiring as CPO1 after 21 years and at HMC Dockyard for 36 years, until he retired. He then volunteered as chairman of hospital sick visiting and visiting privately for the Chief's and P.O. 's Association. 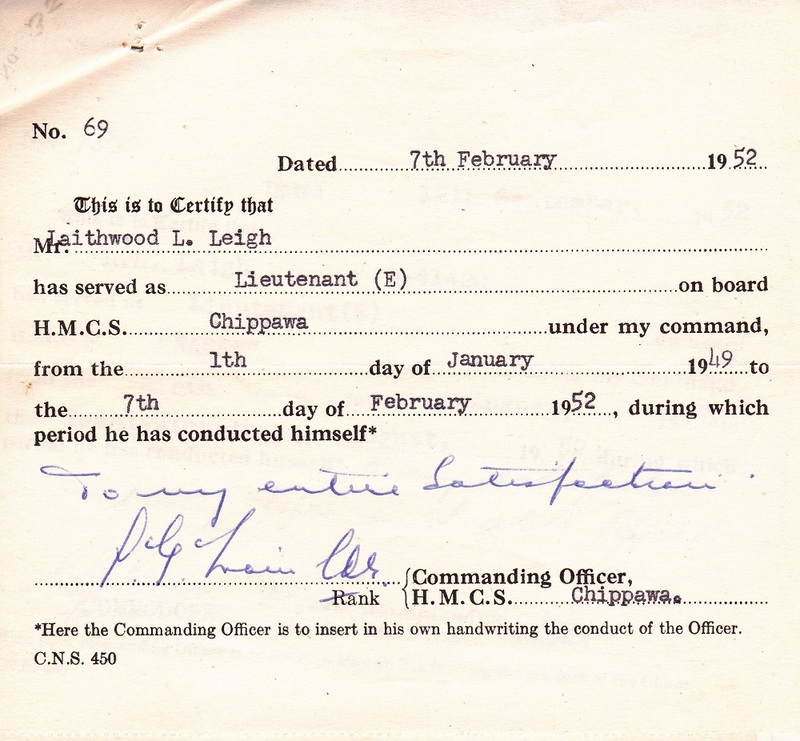 He captained the A.L.S. Tad Day, at the Gorge Centre, for several years, as well as duty at the CPO's Assn., Esquimalt Legion and seniors. We, his family, his naval buddies and many other friends will miss his happy personality, his jokes and wonderful sense of humour. Funeral Service will be held in McCall Bros. Floral Chapel, Johnson and Vancouver Streets, on Thursday, June 15, at 3:00 p.m., with the Rev. H. Silvester officiating. 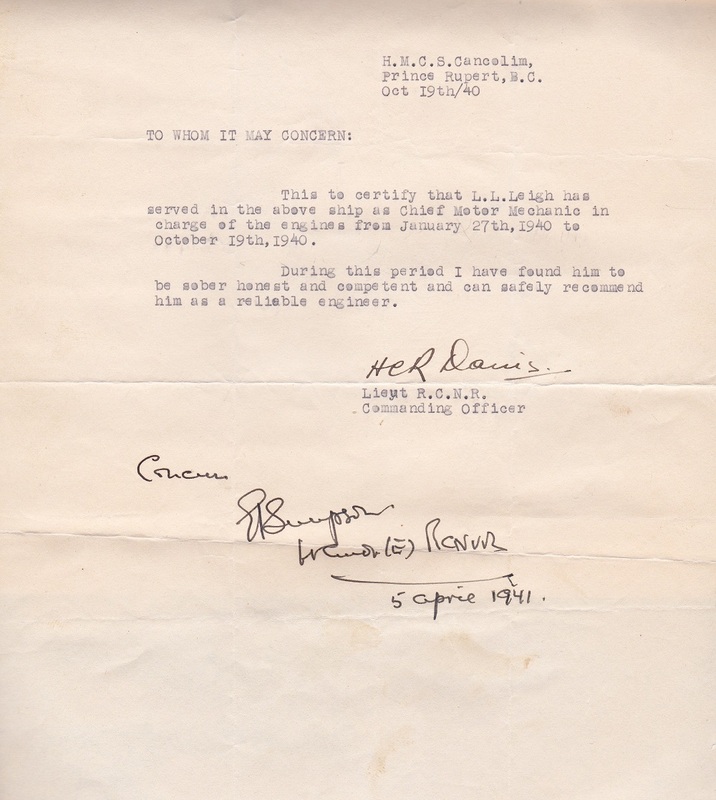 Following, a reception will be held at the Esquimalt Legion Branch 172, Admirals and Esquimalt Roads, in the upper hall. Flowers gratefully declined, donations may be made to the CPOs Association, Esquimalt Legion #172 and the Legion Seniors, would be appreciated. CRANE, Lavinia (Vin) Mary, WRCNS (Wren) - passed away peacefully, surrounded by family and friends. She was an important person in many lives and was dearly loved. Vin developed friendships through her training, work and travel, which she maintained throughout her life. All who knew her will remember her smiling face, cheerful, positive outlook and her love and kindness. A strong, intelligent, independent woman, she was a role model for several generations and will be greatly missed. Vin was predeceased by her parents George Alfred and Isabel (Molly) and brothers: John, George (Selma) and Denis (Joan). She is survived by nephews: John (Heike), Denis G. (Cathy), Les (Mags), Rodger (Alison), Denis D. Jr. and niece Thomasina (Al) Hewer. Eleven great-nieces and nephews, nine great-great nieces and nephews and her "adopted" family: Anne-Marie (Clive), Sue, Kerry (Stewart) and Brian (Deanne) Bingham and their families rounded out her extended family. Family was very important to Vin. She loved keeping abreast of family news, even when it meant learning to use social networks. Then there were her dear friends from university, Wrens and work with whom she kept in touch and enjoyed numerous travelling adventures over many, many years. Born in Westlock, Alberta she moved to Burnaby, BC in 1936. 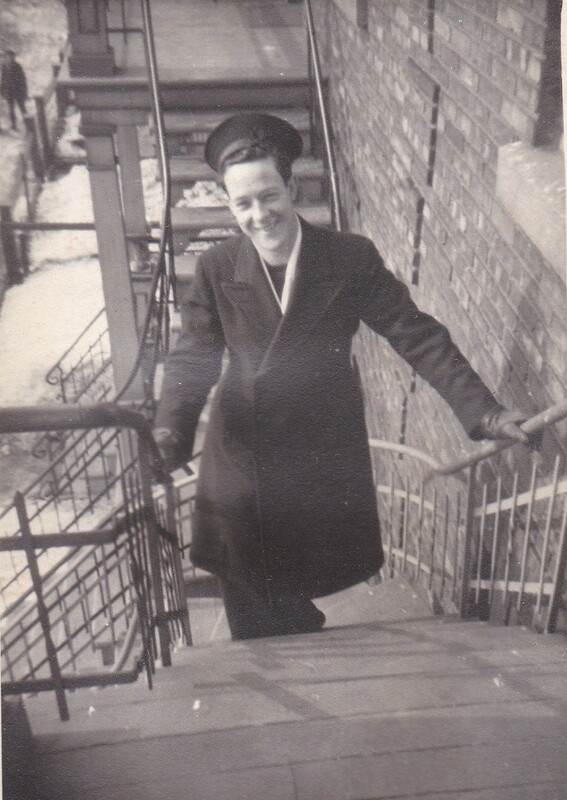 In 1942 Vin embarked on a life-changing adventure by joining the Women's Royal Canadian Naval Service (Wrens). 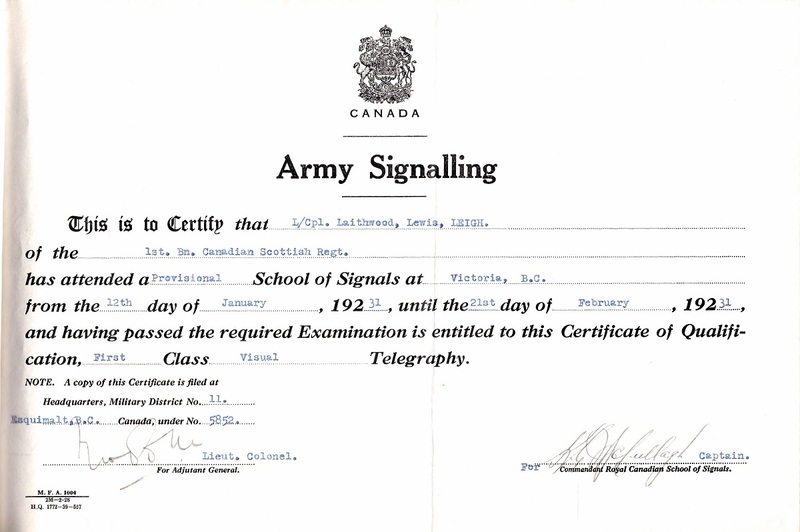 As a Wren, Vin trained as a wireless telegrapher and worked at Special Operations stations, which were part of the larger British Bletchley Park code-breaking "Enigma" program. After the war Vin completed a five-year BScN in Public Health Nursing and became a BC Public Health nurse. In 1961 she completed a Masters degree in Public Health at the University of Michigan and was awarded the American Public Health and American Universities Honour awards. On her return, she continued her career in Public Health Nursing as a Nursing Consultant for B.C. Ministry of Health in Victoria (1961-74), Assistant Director (1974-75) and Provincial Director of Public Health Nursing (1975-1985). When Vin retired in June 1985 she was presented with the President's Award, Canadian Public Health Association. Retirement saw Vin serving on several Health and associated boards and taking on volunteer positions in Victoria. She continued to enjoy travelling, yearly trips to Hawaii to visit her long-time friend, Bea and time spent with family and friends all over the world. Daily walks in Victoria, especially along Dallas Road, keeping up with current events, attending Wren functions and inviting friends over for "happy-hours" and dinners made for a very active life. At the age of 80, Vin rose to the challenge of mastering the computer and iPad to keep in contact with far-flung family and friends and to search the Internet in order to satisfy her desire to learn more. Her life was definitely varied and well lived. The family wishes to thank: John and Heike and Amie and Clive for their love and support of Vin; friends and staff at Somerset House, Vin's home for the past few years and the doctors, nurses and care aids at Jubilee Hospital 4th floor South for their wonderful care and compassion during her final days. COWEN, David L. (04 Feb 1936 - 23 Apr 2017) - It is with deep sadness we announce the passing of David Lloyd Cowen in Victoria on April 23 2017. Born in Edmonton, Alberta. Loving husband, father and grandfather. Survived by his loving wife Margaret, son Michael (Donna) and granddaughter Melissa (Craig); sisters Noreen and Bunny, brother in-law Art (deceased wife Mary); uncle to many nieces and nephews, extended family and friends. David served in the Navy for 20 years, then went on to work with the Victoria School Board until he retired in 1996. After retirement David and Marg bought a boat and loved to go fishing, and enjoyed spending time with his family. MCMAHON, Joan Carole (1942 - 2017) - Born at the time of the bloodiest conflict in history, Joan Carole McMahon spent parts of her childhood in some of the most rugged regions of this great country. Her chores included protecting the homestead from wolverines and bears, as well as walking uphill (both ways) in blizzards to fetch food and firewood. The family eventually settled in Calgary (because it's CALGARY!). 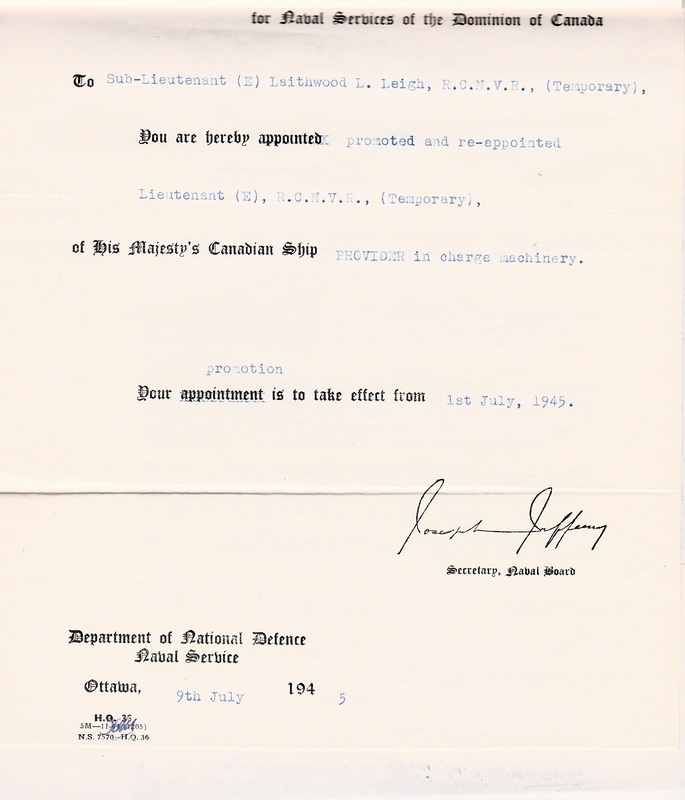 Joan was educated by the Calgary Catholic School District and graduated from the much historied St. Mary's Girls School, granting her Divine Approval to enlist in the Canadian Navy. She served at a time when words such as 'Détente', 'Brinkmanship', and 'Missile Crisis' entered the common vernacular. 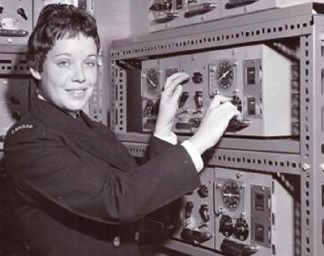 Joan had many duties, one of which was being a submarine hunter on board marine reconnaissance aircraft, protecting our waters from Soviet incursions. It was by sheer luck that no Soviets crossed paths with Joan, for surely the filthy interlopers would have been sent to a watery grave. Joan's next assignment came abruptly, but with great national importance: The procurement and training of three new recruits. All of her life experiences to this point gave Joan the necessary skill sets to shape these recruits into exemplary citizens. Joan had an intensity that allowed her to tackle many activities and overcome obstacles. Her interests included crafts, reading, giving proper advice and ensuring her recruits never strayed from the True Path. Joan enjoyed travel and in her later years she twice visited Cuba as a "vacation", but many close to her believe she went to ensure ALL the missiles were removed. Joan was involved in volunteerism, most recently being the Poppy Fund and the KMITT program at the Sunrise Community Link Resource Center. With unwavering resolve, yet a body wracked by pain and illness, Joan Carole McMahon was forced to stand down on April 8, 2017. Pioneer…Cold War Era Warrior…Mother… A Celebration of Joan's Life will be held at McInnis & Holloway (Eastside, 5388 Memorial Drive N.E., Calgary, AB) on Wednesday, April 19, 2017 at 10:00 a.m. In lieu of flowers or charitable donations, hug your parents or children (if you can). Condolences may be forwarded through www.mcinnisandholloway.com. In living memory of Joan McMahon, a tree will be planted at Fish Creek Provincial Park. 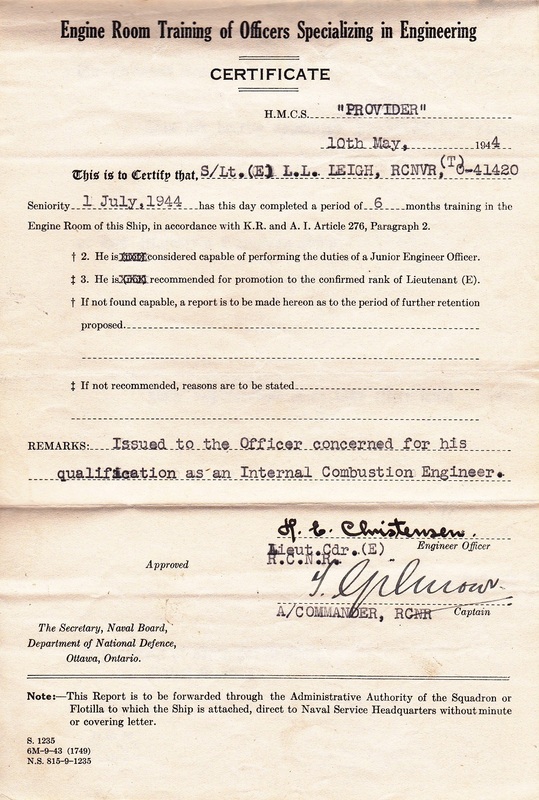 JOHNSON, Kenneth E., C2ET, 17174-E, RCN / C.A.F. (served 08 May 1951 - 04 Nov 1976) (20 Dec 1931 - 14 May 2017) - It is with great sadness we announce the passing of Kenneth (Johno) Johnson, aged 85, in Victoria on May 14, 2017. Ken passed peacefully at the Victoria Hospice surrounded by his loving family. 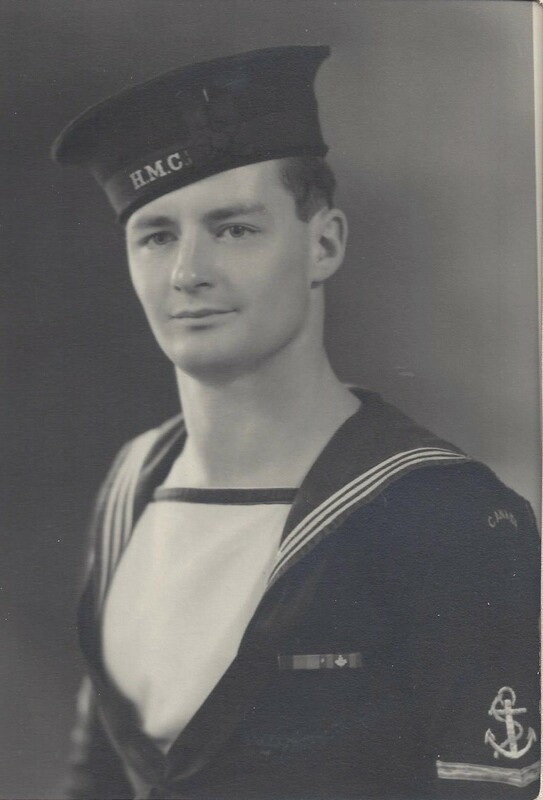 Born in Grimshaw Alberta, to Walter and Martha Johnson, Ken served in the RCN for 25 years, and finished his career in the HMC Dockyard until retirement. 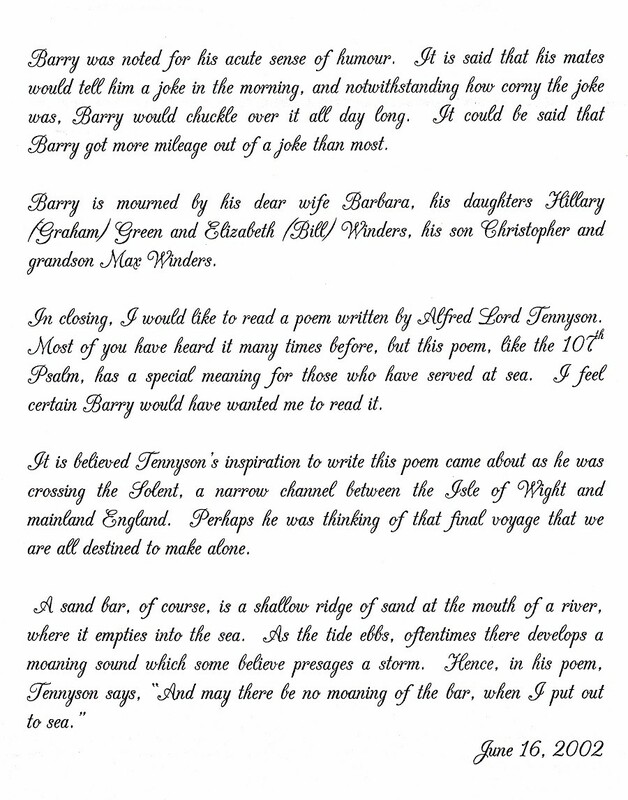 Ken is predeceased by his loving wife Rheta (nee Barry) of 46 years. He will be dearly missed by his children, Linda, Bob (Leslie), Lisa (Robert), Gary (Connie) and 7 grandchildren. 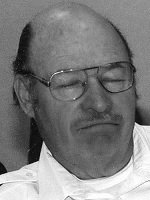 COMEAU, Russell J. 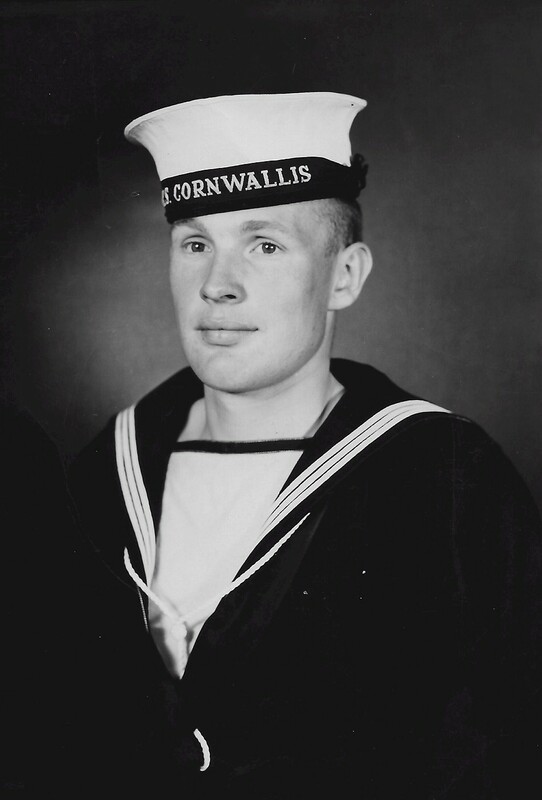 (Russ) (27 Nov 1932 - 28 Apr 2017) - Age 84, of Dartmouth. It is with profound sadness that the family of Russell 'Russ' J. Comeau announces that he passed away on April 28th, 2017, in Dartmouth. Born on November 27th, 1932 in Weymouth, Russ will be lovingly remembered by his wife of 62 years, Mary (Burke), and his children, Judy (Tim) Kohlsmith, Leduc, Alta. ; Dr. Christopher (Chrissy) Comeau, Ogdensburg, N.Y.; James (Betty Ann) Comeau, Ottawa, Ont. He will also be dearly missed by his grandchildren, Anthony, Katie, Kristen, MacKenzie, Burke, Jesse and Dean; great-grandchildren, Nora, Elin and Corbin. He is survived by his siblings, Frances Stiven, Sister Melda Comeau, Louise Haran and Marc Comeau. Russ was predeceased by his parents, Edmond and Marie Rose; siblings, Eli, Linus, Laurent, Delbert, Eric, Andrew and Rosella. 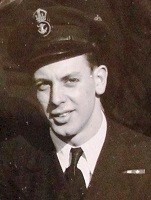 Russ joined the Royal Canadian Navy in 1950, the RCAF in 1954, and in 1957 was promoted to flying officer. 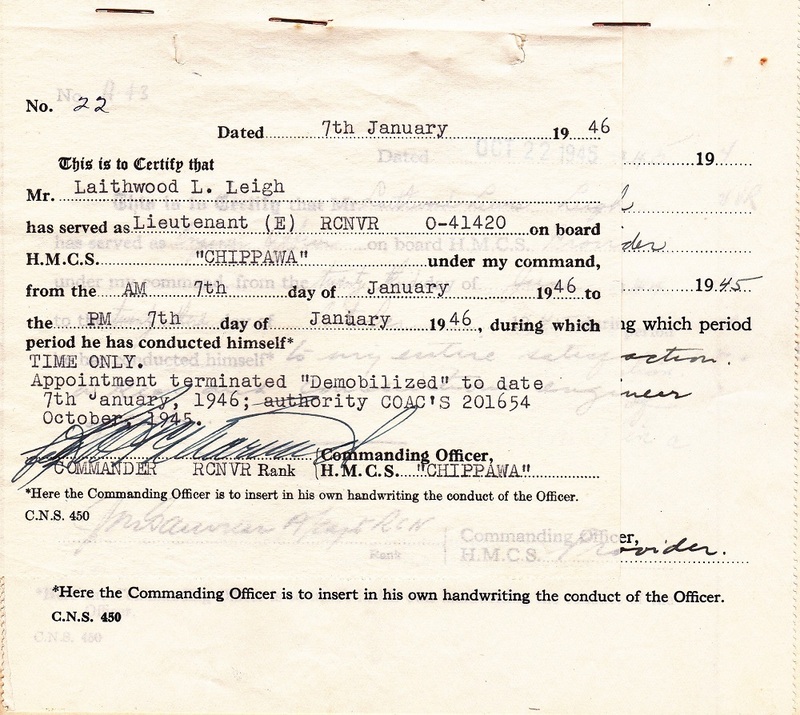 In 1960, he began work at the Halifax Dockyard which led him to a career as a logistics specialist within the Department of Supply and Services Canada. 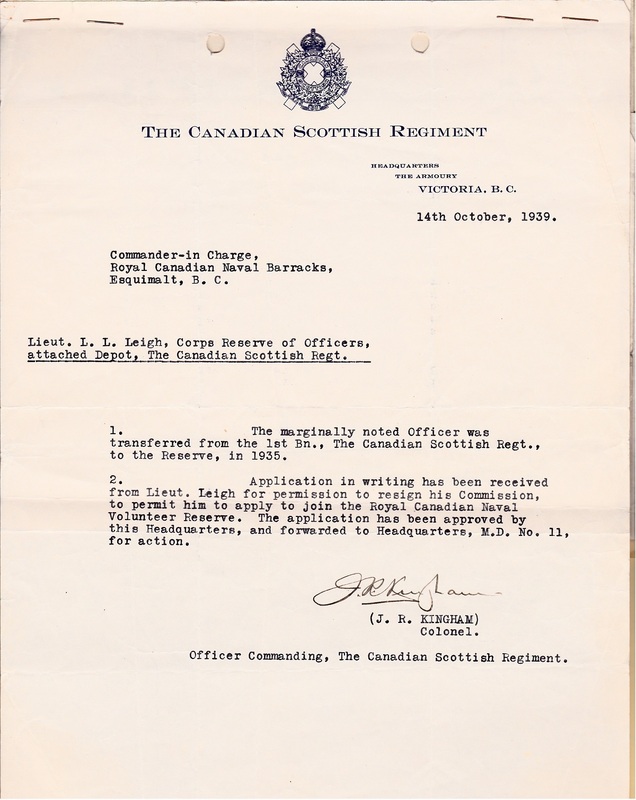 Russ was the National President of the Canadian Forces Logistics Association. 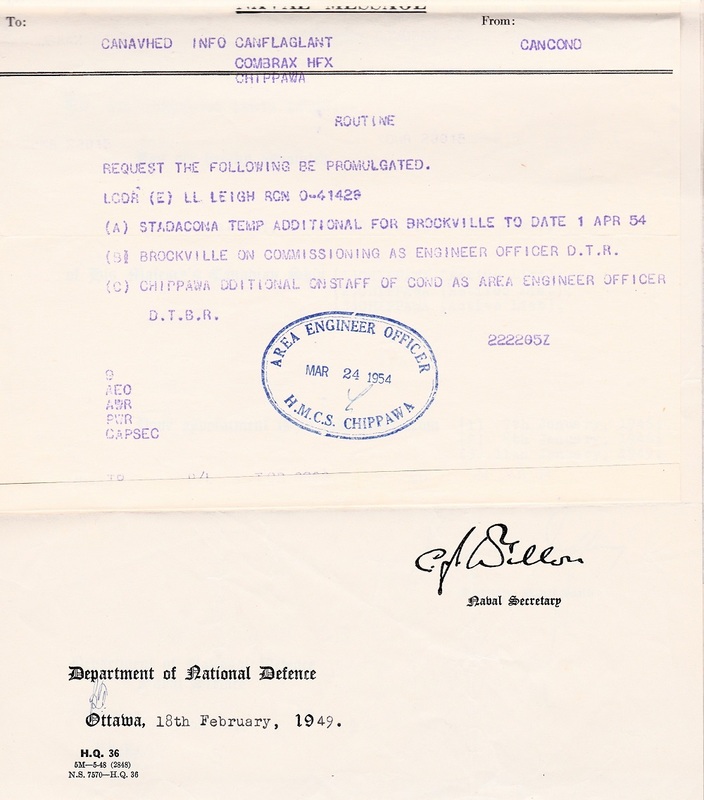 He was also a member of the Council of the Conference of Defense Association. Also, he was a professional purchaser in the Purchasing Management Association of Canada. A proud moment for Russ was earning his B.A. in Public Administration from Dalhousie University in 1976. Russ had many interests. In scouting, he rose to the level of Queen Scout (its highest designation). He had a passion for the militia, and rose to the rank of Lt. Colonel, and commanded the 33 Halifax Service Battalion. He also loved sailing and in retirement went on many an adventure on his sailboat, the Acadian Packet. As the name of his boat attests, he was very proud of his Acadian heritage, supporting and attending Acadian events. Russ had a burning intellect and thirst for knowledge that influenced all that knew him. His generosity was large, his kindness boundless, and his love for life an inspiration. A great man has departed this world, but his spirit lives on in his family and friends. The family would like to acknowledge the wonderful care that Russ received from the staff on Bay Side and Sea Side as well as Dr. Knowlan at Ocean View Manor. A funeral Mass in memory of Russ will be held on Wednesday, May 3, at 11 a.m. in Saint Thomas More Parish, Dartmouth, with a reception to follow. Those who so desire may make a donation in memory of Russ to Alzheimer Society of Nova Scotia or a charity of your choice. LOGAN, Peter Andrew, MS, Naval Radio Operator / Nav Comm, RCN (7 or 8 Apr 2017) - It is with great sadness that the family of Peter Andrew Logan announces his passing at the age of 49 in his Halifax home. 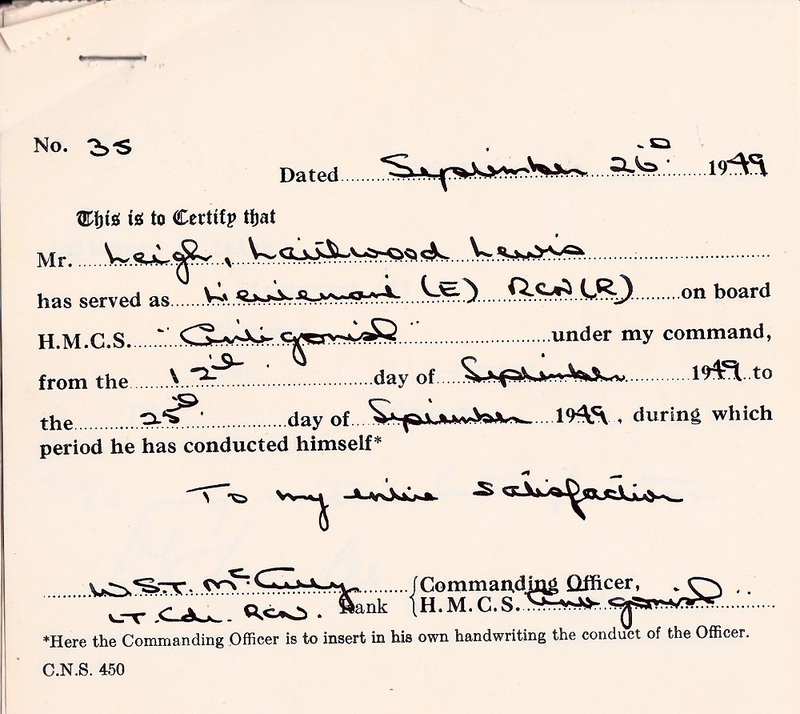 Born in Renfrew, Ont., Peter served in the Canadian Navy as a Master Seaman based in Halifax. He served his country proudly for 24 years and was awarded both for his long-time service and peace-keeping efforts over the span of his military career. Peter will be remembered lovingly by his siblings, Gord (Sandy), Tom (Cecile), and Cathy (Jamie), as well as by his nieces, nephews, and friends. TOBIN, Orrington Edward (Ed) (26 Sep1926 - 04 May 2017) - The family of Orrington 'Ed' Tobin of Halifax is saddened to announce his passing in Camp Hill Veterans' Memorial Building, QEII on Thursday, May 4, 2017 at the age of 90. Ed was born in Canso on September 26, 1926, a son of the late Edward and Alice (Casey) Tobin. In addition to his parents, he was predeceased by his wife, Dorothy (Brown); sisters, Nora Allebone and Vera Yeadon and brother, Leander Pietche. Ed is survived by his loving partner, Gillianne McCully of Halifax; his daughter, Noreen Bondar (Ron) of Toronto; his son, Rick Tobin (Deborah) of Truro; and grandchildren, Scott Tobin (Lisa) of Stellarton; Stacey Tobin (Sean) of Airdrie; Cheryl Tobin (Denis) of Halifax; great-granddaughter, Emma and several nieces and nephews. Ed served with the Royal Canadian Navy during the the Second World War and was a long-standing member of the Canadian Legion. He was an avid music lover, talented guitarist and singer. The family would like to thank the staff of the Garrison West, 5th floor, at Veterans' Memorial for their long-term care. There will be no visitation as per Ed's wishes. Anyone wishing to honour him is asked to do so by supporting our veterans and active servicemen and women. STEGEN, James William (Jim), CD, LCol (25 Jul 1933, Barcelona, Spain - 01 May 2017, Dartmouth, NS) - Age 83, passed away on May 1, 2017 in Dartmouth. He is survived by his loving wife, Elinor (Cornwell); his children, Cindy Webster (Glenn), Ronald (Wendy), and Andrew (Marie); his grandchildren, Corey (Lisa), Gillian, Hannah, Samantha, Alix, and Mathew. 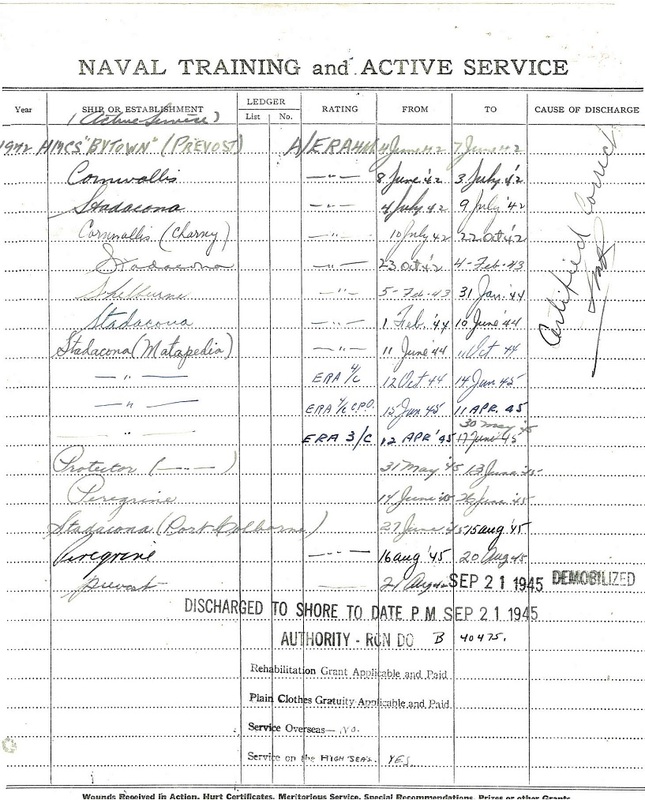 Predeceased by parents, Gaston and Margarita (Singleton), and older brothers, Fred and George. Born in Barcelona, as a toddler the family was evacuated to England by the Royal Navy at the start of the Spanish Civil War. They returned to Spain only to be faced with the onset of the Second World War and decided to emigrate to Canada, settling in Montreal. 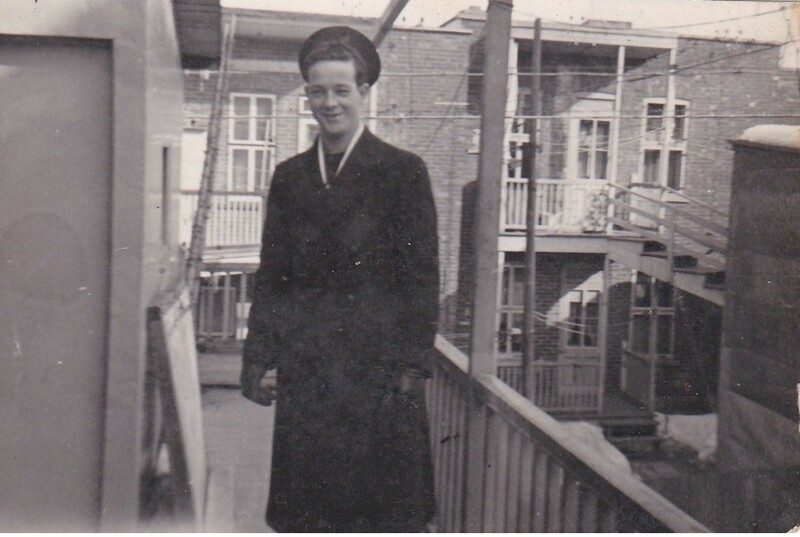 At 17, Jim joined the Royal Canadian Navy, was commissioned, and married Elinor, a RCN nurse senior to him at the time. Jim earned his Wings, and served 36 years in many different postings in the air, at sea and on land. He was most fond of his time flying off the carrier HMCS Bonaventure. 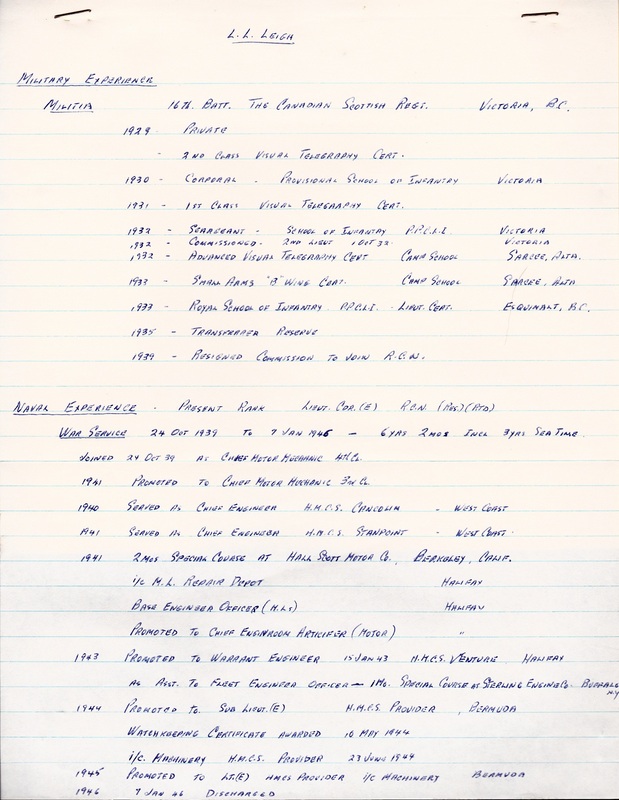 After retirement, Jim and Elinor settled in the Annapolis Valley, where he attended Acadia University as a mature student and obtained his BBA. Jim was a tireless lifelong volunteer for many community organizations, most notably the Boy Scouts (Silver Acorn Award) and Rotary Club. There will be no service at this time. Donations in Jim's memory can be made to the Rotary Club of Wolfville (rotaryclubofwolfville.org) or Shearwater Aviation Museum (samfoundation.ca). WARREN, Robert Edward (Bob), CPO2 (14 Jan 1942 - 08 May 2017) - age 75, of Welshtown. It is with great sadness that we announce the passing of a husband, father, stepfather, grandfather, uncle, and brother-in-law, who peacefully passed away at home on May 8, 2017. Born in Cobalt, Ont., Bob was a son of the late Gordon and Florence (Watterson) Warren. 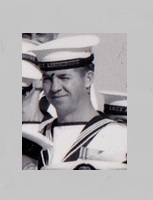 Bob joined the Royal Canadian Navy in 1959, retiring in 1981. He continued his career with 102 CFTSD until 1988 when he moved to DSS/PWGSC as Contracting Officer. Upon his retirement, Bob formed his company Larboard Marine Services, and provided Marine Consulting to Shelburne Ship Repair. Bob enjoyed his retirement at the cottage in Welshtown, where many projects and renovations kept him happily busy. His sense of humor and his gift of the gab, and eagerness to tell stories were his trademark and special to all of who knew him. Bob will be sadly missed by his wife, Lilianne (Davis); sons, Barry (Cathy), Bobby (Dawn), Kevin (Cindy); stepson, Daniel MacKay; stepdaughter, Carly MacKay; grandchildren, Craig, Kyle (Jill), Keith (Cheryl), Kayla, Cody, Sidney, Dylan, Alyssa, Patrick; great-grandchildren, Blake, Zoe, and Ethan; many nieces and nephews, and many step nieces and step nephews. He was predeceased by sister, Barbara Despres (Thomas); brothers, Ronald (Helen), Gerald (Theresa). Cremation has taken place under the direction of H.M. Huskilson's Funeral Home and Crematorium Ltd. A Celebration of Life will be held on Friday, May 19 at 2 p.m. in H.M. Huskilsons Funeral Home, Shelburne. In lieu of flowers, donations may be made to the Canadian Cancer Society, Victorian Order of Nurses, or charity of choice. 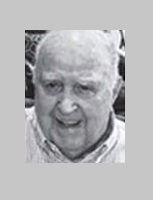 SPENCER, Frederick Earl (1925 - 12 May 2017) - The death of Frederick Earl Spencer in his 92nd year, of River Philip, occurred in Cumberland Regional Hospital on May 12, 2017. A lifelong and very proud resident of River Philip, Fred was a son of the late Trueman and Gertrude (Patriquin) Spencer. 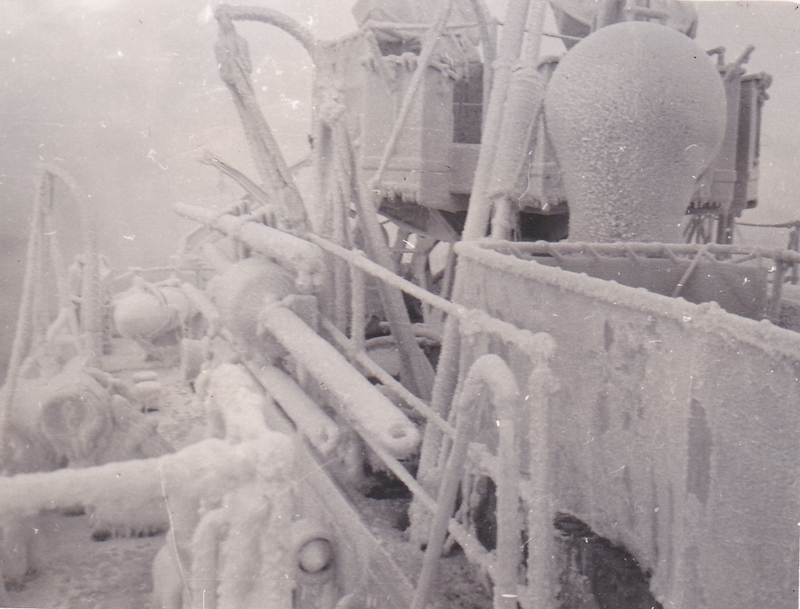 Fred is survived by his wife of 61 years, Bonnie (Keiver); son, Brent (Helen), of Riverview, N.B. ; daughter, Laurel (Gil) Giles, of Moncton, N.B. ; granddaughters, Jana and Courtney Giles, of Moncton, N.B. ; sister, Doris (late Vaughn) Smith, of Dartmouth; sister- in-law, Marie Spencer, of Shelburne; several nieces and nephews. Besides his parents, Fred was predeceased by brothers, Edwin and Layton; and sisters, Jean and Ella. Fred, first with his father and then with Bonnie, owned and operated Spencer's General Store in River Philip for over 50 years. The store for many years served as the focal point of the community and Fred enjoyed the company of thousands of people he met over the years while serving the public. He also served as postmaster in River Philip for many years, retiring from both positions in 1990. 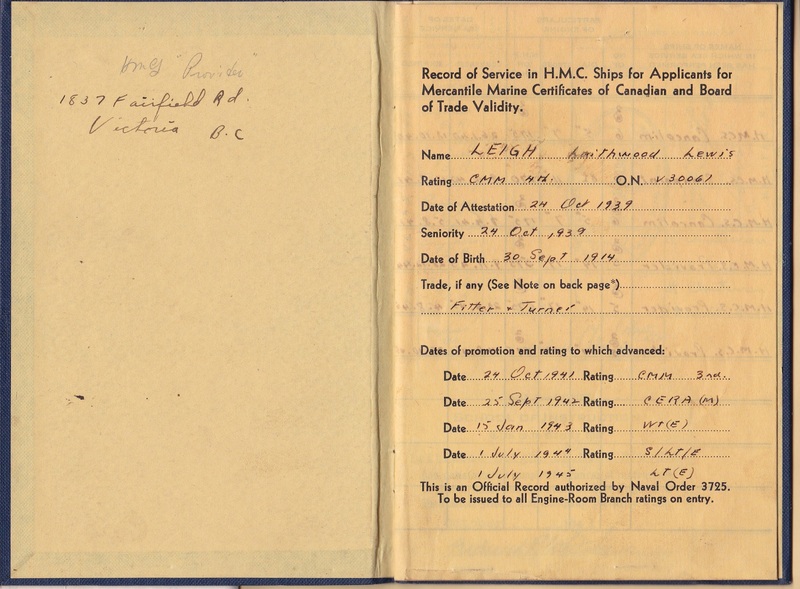 Fred served in the Royal Canadian Navy during the Second World War aboard the minesweeper HMCS Blairmore. Active in the Community, Fred was a member of the Masonic lodge in River Philip and had recently been awarded his 70 year membership pin. Fred was also a former officer of the Masonic Grand Lodge of Nova Scotia. Fred served for many years as an elder, steward and treasurer for the River Philip United Church and was a long-time member of Branch No. 36 Royal Canadian Legion in Oxford. Arrangements have been entrusted to Allen's Funeral Home of Oxford. There will be no visitation or public service. Burial will be in the River Philip United Church Cemetery. Memorial donations may be made to the River Philip United Church cemetery Fund or to the charity of one's choice. Sharing of memories and condolences may be sent to the family by visiting Fred's online memorial at: www.allenfuneralhome.ca or through the W. Allen Funeral Home. ORR, Donald Gerard, Fin Clerk (07 Feb 1958 - 12 May 2017) - Age 59, passed away peacefully surrounded by his loving family on Friday, May 12, 2017. Donnie was born in Halifax and lived on Dublin Street until joining the forces in 1975. He retired in 2009 after 34 years of dedicated service. Donnie was married to his best friend Shelley for 36 years, during which they had three boys and lived in Halifax, Dartmouth, Germany, Debert, Saint John, Ottawa and Kingston. Left with fond and loving memories are his wife, Shelley; sons, Kevin (Ashten) and Brandon; grandson, Kayden; siblings, Bob, Phillip (Jane), Joseph (Mike) Orr and Judy (Rick) Naugler. 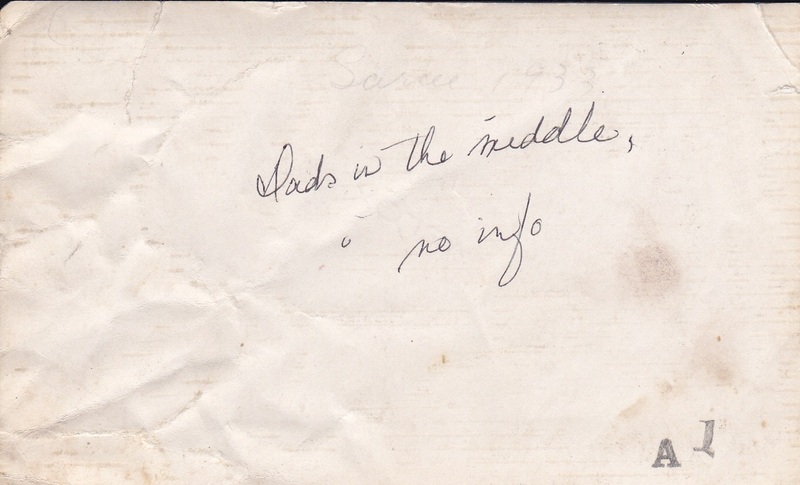 Predeceased by his beloved son, David (1996); parents, John and Jean Orr; siblings, Jackie, Billy and Mary. Donnie was known for his sense of humor and kindhearted nature. He had many lifelong friends and will surely be missed by many. Visitation will take place from 2-4 and 7-9 p.m. on Tuesday, May 16, in Atlantic Funeral Home, Dartmouth Chapel, 771 Main St., from where the memorial service will be held at 11 a.m. on Wednesday, May 17, with reception to follow. Interment in Fairview Lawn Cemetery. LeBLANC, Roger Hawkins - (28 Nov 1931 - 13 May 2017) - Age 85, of Halifax, passed away Saturday, May 13, 2017, in Camp Hill Veterans' Memorial Building, QEII. Born in Moncton, N.B., he was a son of the late Maude (McKay) and Claude LeBlanc. 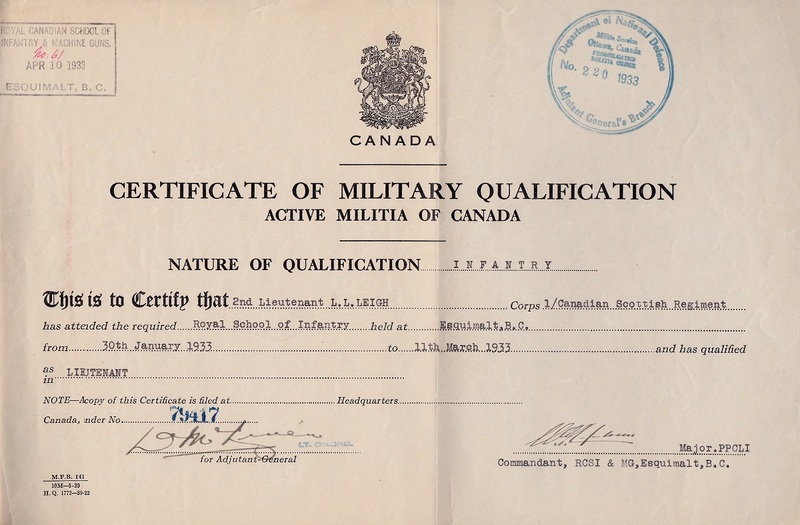 Roger was a proud member of the Canadian Armed Forces for 36 years. He enlisted in 1950, and was on tour in Korea, Japan, Indonesia, Germany, Vietnam, Africa and Middle Eastern countries. 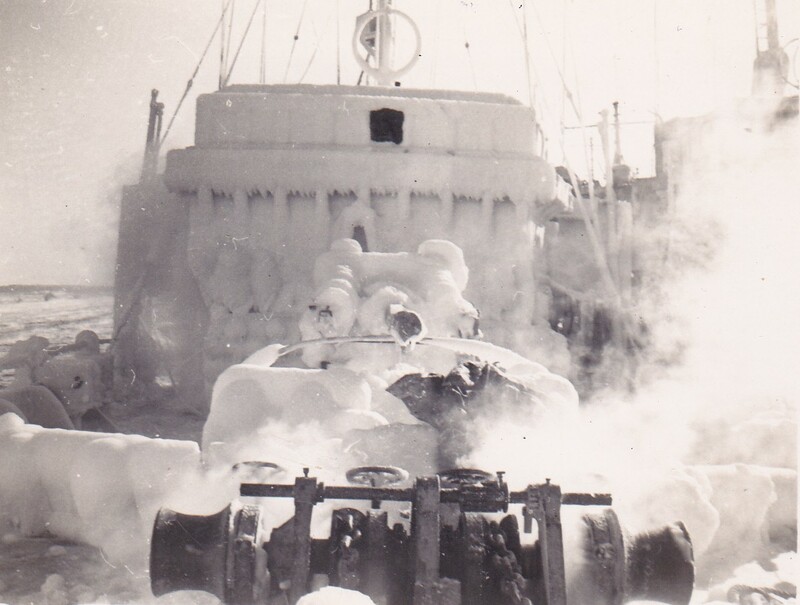 He also served on HMCS Saguenay. 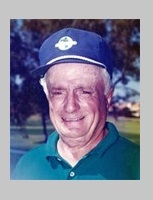 He was an avid and passionate golfer. 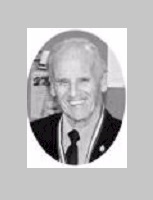 He loved and played hockey and also refereed for many years for the Ontario Hockey Association. After retirement he became a snowbird and headed south for the winters. Roger will be forever missed by his family and friends. He is survived by his loving wife of 37 years, Myrna; son, Paul (Betty), London, Ont. ; stepsons, Steven (Sharon), Windsor; Kevin (Christine), Halifax; and Mark (Kelly) Sampson, Ottawa, Ont. ; stepdaughter, Cindy (Donnie) King, Dartmouth; grandchildren, Taylor, Brooke, Tonia, Nathan, Mitchell, Keith, Rebecca and Patrick. Besides his parents, he was predeceased by his daughter, Janet LeBlanc; sisters, Doreen Miller, Ruth Smith, Shirley Capson; and brothers, Donald and Vincent LeBlanc. We would like to thank the staff at V3-East Veterans' Memorial Building for their kind hearts and professional care. Cremation has taken place. A graveside service will be held at 2 p.m. Wednesday, May 17, in Oakridge Memorial Gardens, 1078 Old Sackville Rd., Middle Sackville. A time of fellowship and light refreshments will follow at 1 Oakwood Court, Dartmouth. 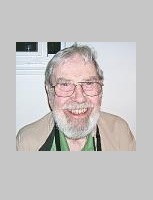 MOSER, Harold L. (Ben) - (25 Aug 1931 - 16 May 2017) - age 85 of Dartmouth, passed away on May 16, 2017 in Shoreham Village, Chester. 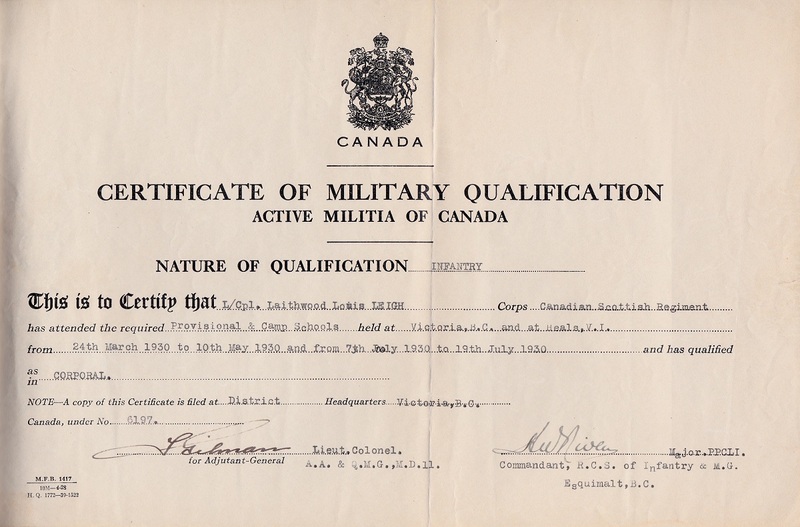 Born in Kitchener-Waterloo, Ont., he was a son of the late Ida (Oswald) and Enoch Moser. 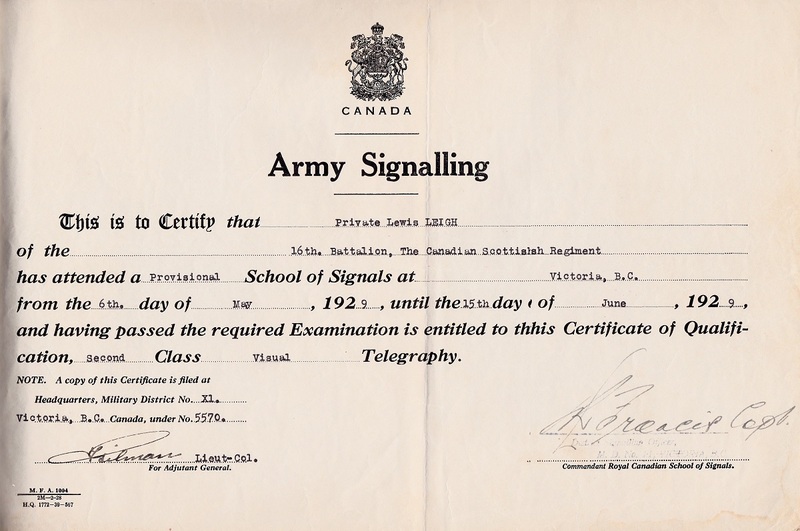 Ben's career was with the RCN where he served as a signalman on several Canadian ships. 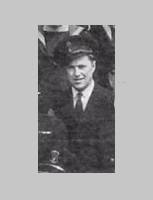 In later years, he served as a seaman with the Bedford Institute of Oceanography and during retirement, worked part-time as a taxi driver. He was predeceased by his partner of 39 years, Minnie (Grant) Bremner. Cremation has taken place. At Ben's request, there will be no visitation or funeral service. Special thanks to the staff of Shoreham Village and 'Ducky' for your care and kindness. LeMESSURIER, Les, CD, PO1, Mar Eng (11 Jun 1945 - 06 May 2017) - It is with great sadness that his family announce his passing at Kingston General Hospital on Saturday, May 6th, 2017 in his 72nd year. Les was a beloved husband, father, grandfather, "papa", brother, uncle, and friend to all. A celebration of life in Les's honour will be held at a later date. As expressions of sympathy, donations to the Heart & Stroke Foundation would be appreciated by the family. "Has gone to sea one last time"
HUBBARD, Kenneth Arthur Henry (03 Jul 1935 - 05 Mar 2017) - Age 81 of Glen Haven, passed away suddenly on Sunday, March 5, 2017 in Halifax. Born in Gorlestonon-Sea, England on July 3, 1935, he was the son of the late Arthur and Edith (Morse) Hubbard. He was deeply loved by his family and friends, and highly respected by countless others. 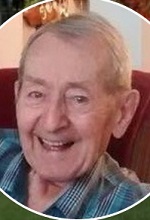 He is survived by his loving wife, Caroline Louise (Bennet) Hubbard; sisters, Maureen Hubbard and Jennifer Brown; daughters, Amanda (Steve Kissel) and Sarah Tingley (Geoff ) and son, Jamie (Lyn Kerans), as well as by his beloved grandchildren, Helen Kissel, Jay Hubbard, Sandy Hubbard and Anna Louise Tingley. He is also missed by a large extended family and many close friends. He was predeceased by a young sister Eileen, in childhood, and by his infant daughter, Susan Louise. Ken entered Dartmouth Naval Academy in Dartmouth, England and then graduated from RNC Greenwich. He went on to enjoy a successful career in the Royal Navy, where he retired as Lieutenant Commander. 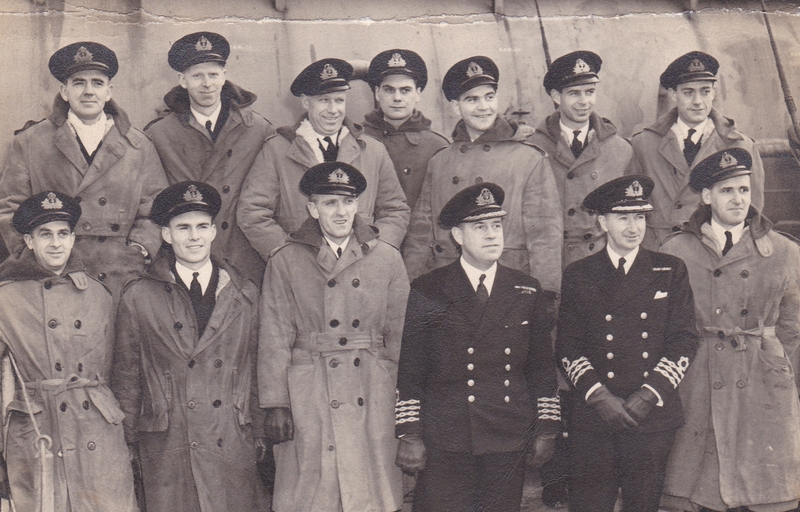 Ken first came to Halifax to join the Sixth Submarine Squadron in 1958. Here he met Caroline Bennet, who held his heart forevermore. They married in England in 1960 and together raised a happy, loving family. 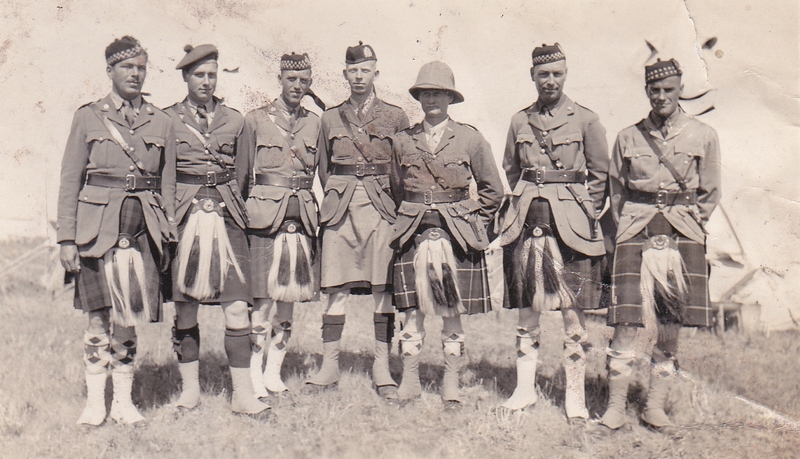 They enjoyed the opportunity to live in many parts of the world over the years, with time spent living in England, Scotland, Singapore, Labrador and Nova Scotia. Ken emigrated to Canada in 1968, working at Wabush Mines in Labrador as Labour Relations Manager for several years before moving to Nova Scotia, where he began a new career as a Management Consultant. Ken's insights and advice were highly sought after throughout his career by colleagues, clients, and those he connected with in all facets of his life. Ken was a man of honour, who taught his children the value of working hard, respecting others, and following through on commitments through his example of doing the right thing, not necessarily the easy thing. He demonstrated that there was deep value in serving others through many years of volunteer work, and his willingness to help his friends and community. He had an especially deep connection with St. Paul's Anglican Church, French Village, where he served as both Warden and Treasurer. Ken's work ethic and vigour were legendary. In just over one week, in 1974, he and his friends built the beautiful log home in Glen Haven that he and Caroline lived in from then on. From this treasured spot, they raised their family, welcomed friends, and never tired of taking in the view. After Ken's retirement, he and Caroline were a familiar sight walking on Indian Point Road each and every weekday morning, throughout the year. In their later years, they led active and adventurous lives, trekking across Newfoundland, New Zealand, Austria, Wales, Scotland, Ireland and England, where they completed the Coast-to-Coast Walk, one of many memorable distance hikes they enjoyed. A funeral service will be held at 1 p.m. on Saturday, March 11, officiated by Rev. Brieanna Andrews, and assisted by Rev. Neale Bennet, in St. Margaret's Anglican Church, 36 St. Margaret's Crescent, Tantallon. No prior visitation. In lieu of flowers, a donation in Ken's memory to Parkinson Canada or St. Paul's Anglican Church, French Village would be appreciated. CERESINO, Joe - passed away peacefully at Bethammi Nursing Home on May 23, 2017 at the age of 93 years. He was born in Port Arthur on March 26, 1924 to proud immigrant parents, Frank and Emilia. He was the oldest of four boys and provided care for his parents throughout their senior years. In his youth, Joe enjoyed hockey and baseball, but golfing was his life's passion until he met Helen (Huchenski) Sillman in 1974. In 1975, after a wonderful courtship, they married. Their shared love of golf took them on many adventures. 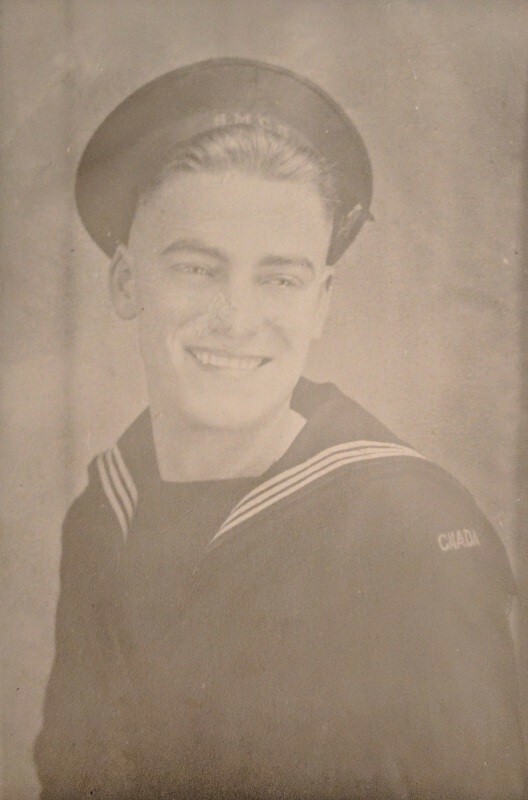 Joe joined the Canadian Navy near the end of World War II and talked often about his experiences on the war ships. He joined Northern Telecom (and eventually Nortel) as a linesman and then worked for a number of years as a stockbroker for Midland Doherty before he fully retired. Joe and Helen wanted to golf all year round, so they decided on a second home on a golf course in Mesa, Arizona. Joe's goal was to always have a golf score that was less than his age and, even into his mid-eighties, he consistently accomplished that. Joe “loved” the Blue Jays unconditionally, regardless of their performance!! He followed the stock markets closely and, even up until his last days, questioned if the stocks were up or down. He was a great handy-man, grew tomatoes from seed and made his own pasta. Our family spent many Sunday dinners together eating spaghetti with Helen's home-made spaghetti sauce and Joe's pasta. Joe is survived by his wife Helen, her children Charlene Sillman (Dalton Prince) and Janet Sillman (Tom Walters), grandchildren Laura Dahlgren (Eric), Ryan Belluz (April), Michael Belluz, Justin Sillman, Kaila Sillman (John Russell), Timothy Walters and Alina Walters, and four great-grandchildren. He is also survived by his brother Angelo (Pauline) of Beeton, Ontario, sister-in-law Lorraine in California and numerous nieces and nephews. He was pre-deceased by his parents, Frank and Emilia, brothers Ray and Mario, sister-in-law Rose and step-son, Kenneth Sillman. Funeral services will be held on Saturday, May 27, 2017 when family and friends will gather in St. Andrew's R.C. Church for the Funeral Mass beginning at 11:30 a.m. celebrated by Rev. Antoni Fujarczuk. The interment will take place at a later date in St. Andrew's Cemetery. In lieu of flowers, donations to St. Joseph's Care Group - Bethammi Nursing Home would be greatly appreciated. Arrangements are in care of the Sargent & Son Funeral Directors, 21 N. Court Street. 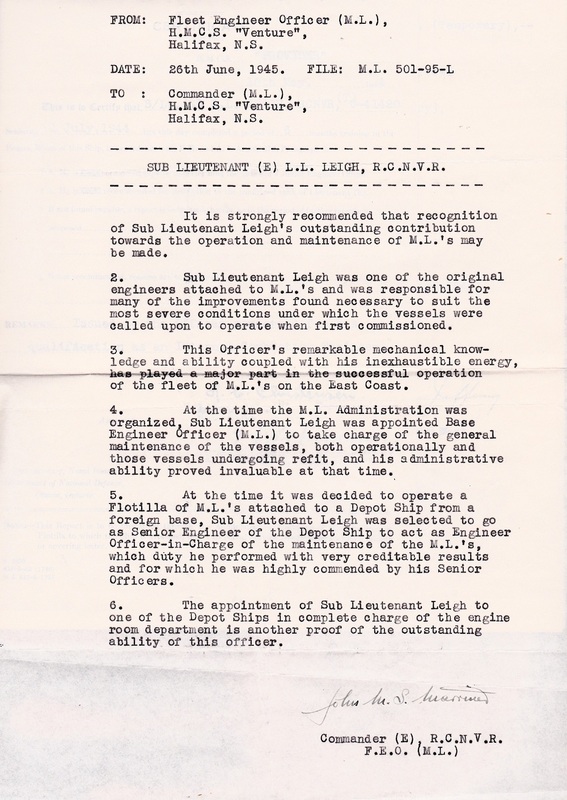 (10) Diesel Power Plant Operators Certificate (11) Letter of Recommendation from L. Gardner & Sons Ltd (12) United States Naval Institute Membership (13) Laithwood Leigh on unknown ship - possibly HMCS Provider (14 & 15) Unknown minesweeper iced up (16) Unknown officer climbing down ladder to what appears to be a Fisherman's Reserve vessel (17) Group of officers - occasion and location unknown. RCN photo Laithwood Leigh, back row, 2nd from left. 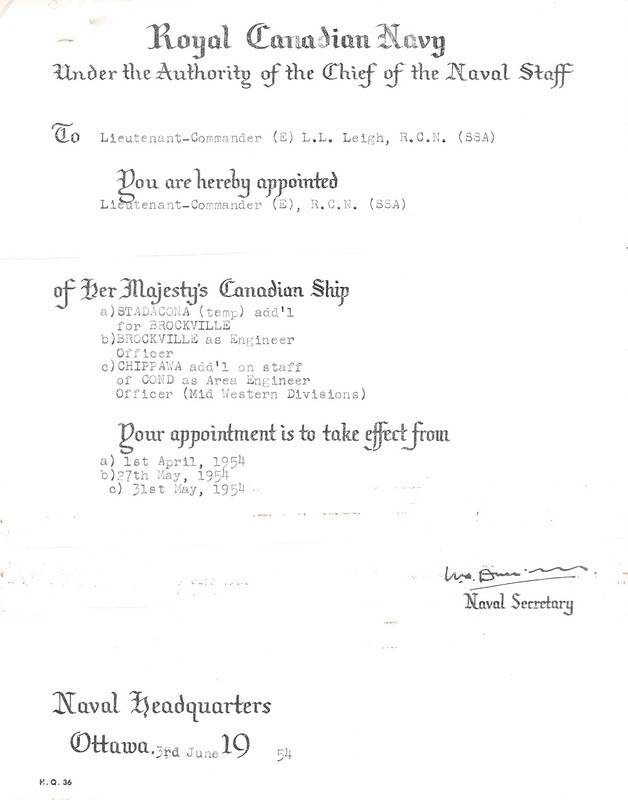 WARD, Richard Martin, O-76045, Chaplain IV, RCN (29 Jul 1913, Toronto, ON - 15 May 1956, Orleans, ON) - a Roman Catholic priest, enrolled in the Royal Canadian Navy as a Chaplain on the 3rd of July 1944. 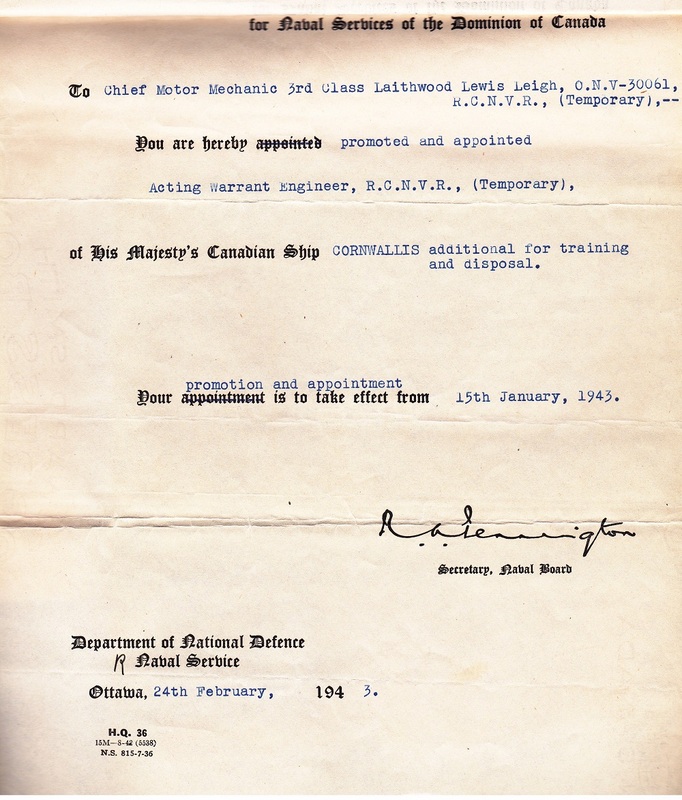 He had been a parish priest in Toronto and after joining the Navy and completing training he was appointed to shore bases on both of Canada’s coasts. When the Navy’s aircraft Carrier HMCS Warrior was assigned to the Pacific Fleet, Ward was named as Chaplain (RC). He accompanied Warrior when she was returned to the RN and joined her replacement, HMCS Magnificent, in the same capacity on her commissioning. 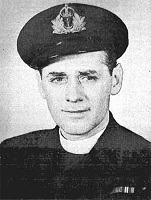 In September 1950 Ward, now a Chaplain III, joined HMCS Cayuga on the staff of CANCOMDESPAC. 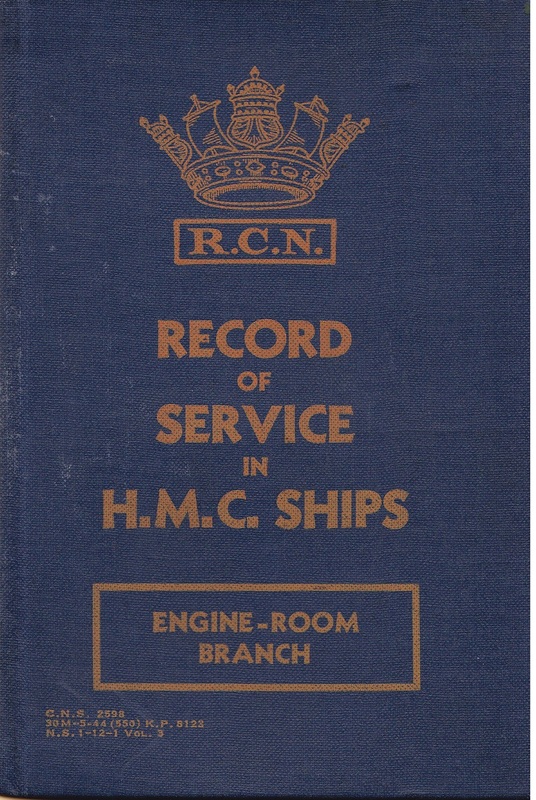 In this capacity Ward served as chaplain to the three destroyers then serving in Korea, HMC Ships Cayuga, Athabaskan and Sioux. 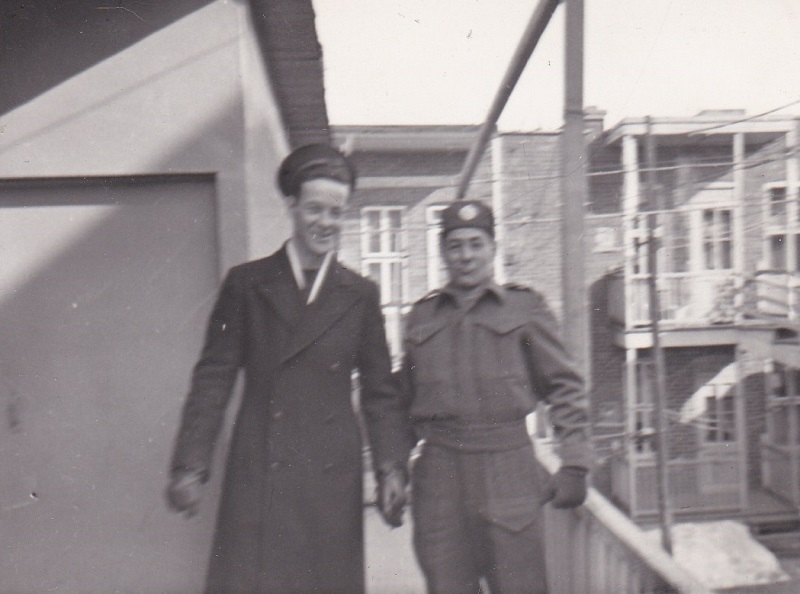 He completed his 2nd Korea tour in HMCS Nootka in the same capacity and then re-joined Cayuga for her 2nd tour. 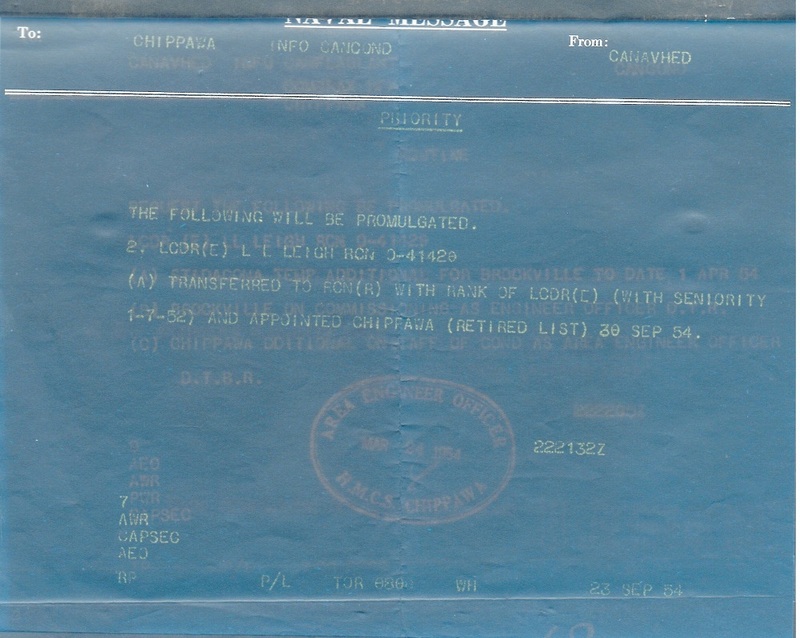 When the Pacific based destroyers were relieved, he would return to Canada in November 1951. Chaplain Ward, promoted to Chaplain IV (Commander level), then became the RC Pacific Coast Command Chaplain which included Royal Roads Military College. 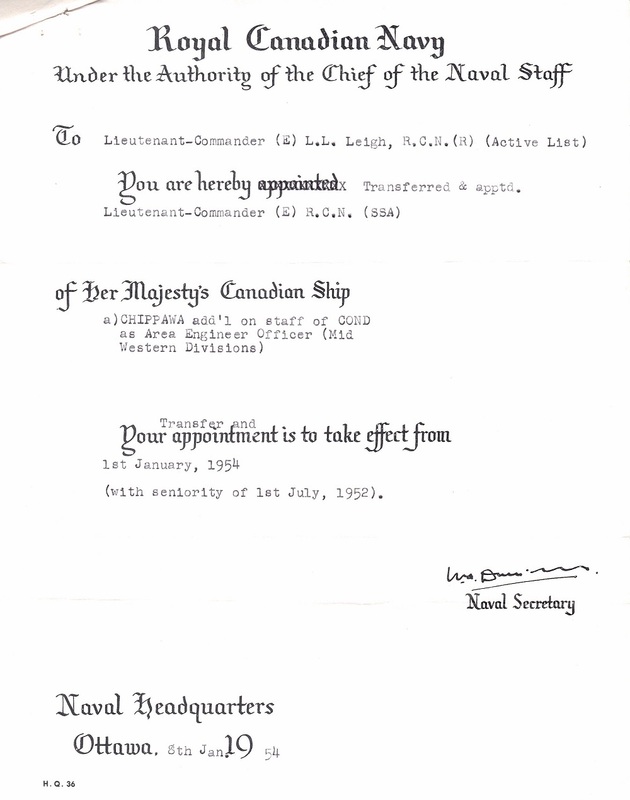 Following this appointment, he was assigned to Naval Headquarters, Ottawa, as Assistant Chaplain of the Fleet (RC). He would also undertake duties as chaplain to the Grey Nuns’ Rest Home, Orleans, Ontario. Late in the evening of May 15 1956 an RCAF CF100 based at Uplands RCAF base, Ottawa, on an intruder intercept mission inexplicably crashed into the Rest Home killing 15 including Padre Ward. The inquest was not able to determine the cause of the jet’s malfunction but Chaplain Ward was lauded for his efforts to get the residents of the home out before he died on the lawn where he had been flung by the exploding aircraft rockets. 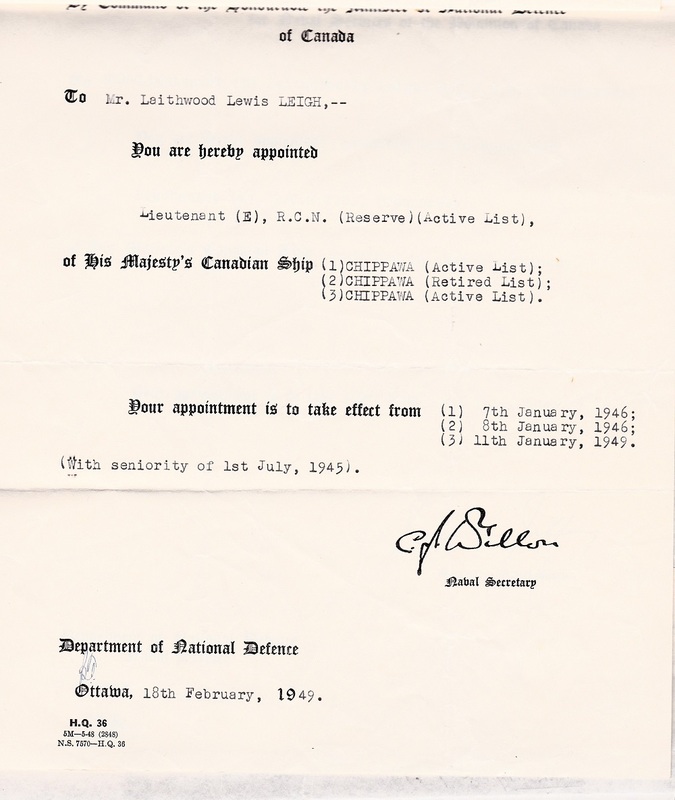 His WW2 service resulted in the award of the CVSM and the 1939-45 War Medal and his service in the Korean theatre the Queen’s Korea (Canada) and the United Nations Korea Service medal. 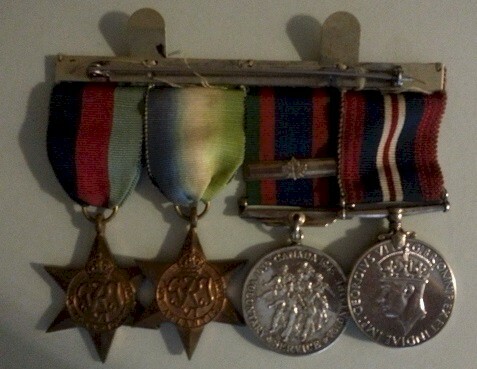 Chaplain Ward had received his medals about 6 months before his tragic death. 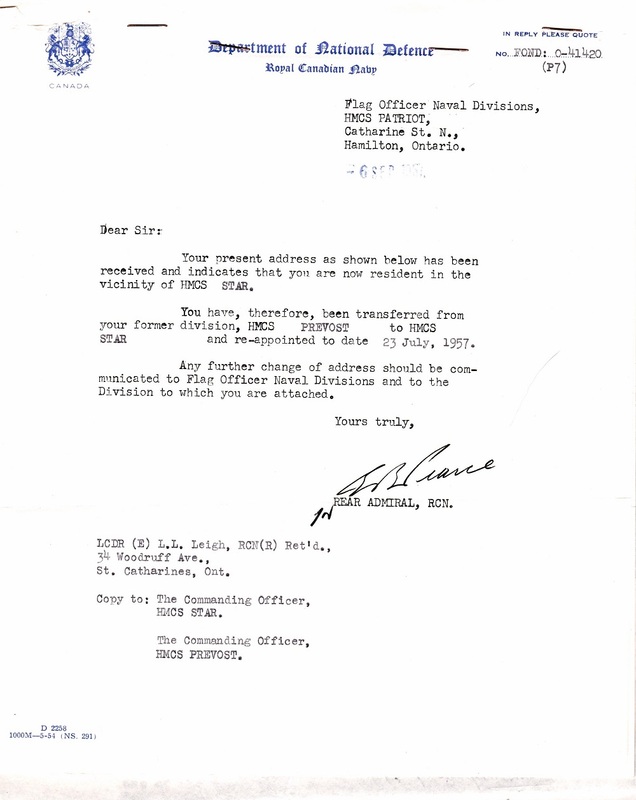 An article in the Ottawa Citizen of June 12, 1956, included this: “A war service medal inscribed with Father Ward’s name was found buried 29 feet in the ground”. DIBBEN, Robert Sheppard - At University Hospital, on Monday, Oct. 4, 1982, Robert Sheppard Dibben of 1270 Webster St., in his 69th year. Beloved husband of E. Eileen (Pratt) Dibben. Dear father of William of Fort Erie, also loved by 2 granddaughters Alicia and Mackenzie. There will be no funeral home visitation. A memorial service will be held on Wed, at 1 PM at Logan Chapel Furtney Funeral Homes, 471 Dundas St. with Reverend Dr. Reid Vipond of Metropolitan United Church officiating. Cremation. Friends who wish may make remembrances to the Cardio-Vascular Research Fund, c/o University Hospital, London. WAMBACK, Leland Herbert - It is with heavy hearts, the family of Leland Herbert Wamback, announce his passing on Saturday, May 27th, 2017, just shy of his 97th birthday, in Camp Hill, Halifax. Born in East LaHave, Leland was the son of Bessie Helena May (Wentzell) and Garrett Obed Wamback. 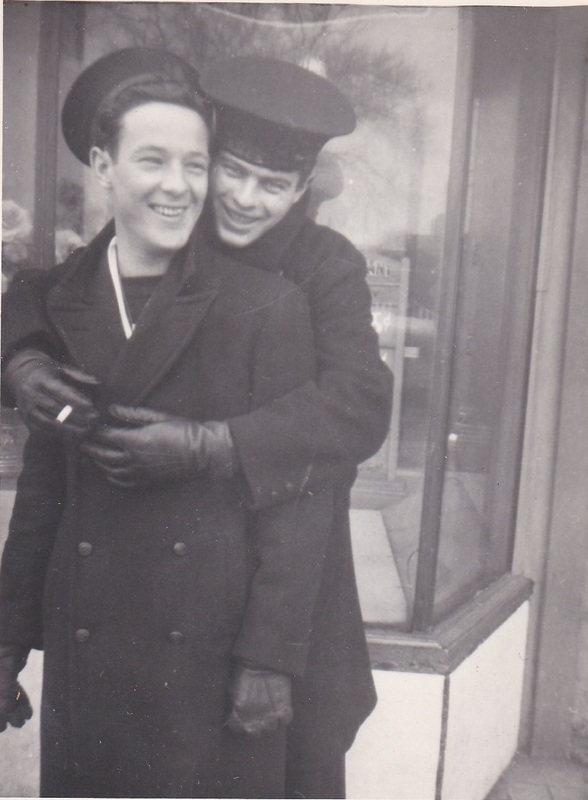 He joined the Royal Canadian Navy in 1943; while stationed in Saint- Hyacinthe, Quebec, he met his wife, love of his life, Hazel. Moving back to Halifax, he completed his apprenticeship in metalwork, and worked for Hermes Electronics Limited for 30 years. Following retirement, Leland and Hazel moved back to his family home in East LaHave where he and Hazel ran Riversford Bed & Breakfast for several summers-opening their home to those who shared the same passion for travelling. Spending 20 winters in Florida, they formed wonderful lifelong friendships. While there, he and Hazel enjoyed time at Chulavista and Hawaiian Isles, partaking in ice cream socials, shuffleboard, supporting Hazel and her fellow "Hula Cats" performances, dabbling in construction, biking, swimming, evenings spent playing game after game of "hand and foot" while always opening their door to family and friends. Leland was an avid crafter & woodworker and when not in the garden or on the ride on mower he could be found in his workshop. He created a business selling his beautiful "whirligig" creations along the South Shore. Leland was a delight to be in the company of, always had a positive take on life itself, a great sense of humor, a kind soul and a perfect gentleman,- Leland was adored and loved by all who knew him. There was nothing he liked better than an interesting conversation. The past six years, Leland resided at Melville Heights where he became a part of the Melville family- enjoying games of crib and challenging puzzles with fellow residents. He is survived by daughter Claire Pelerine (David), son Gary Wamback (Janice), granddaughters Sara Durling, Laura Cesana (Fabrice), grandson Jonathan Wamback (Amy), all of Halifax, step-granddaughter Jennifer Leahy (Shane), England, great-grandsons Aidan, & Mac Cesana, Leland (Jr) Wamback, and nieces Norma Macdonald & Marlene Buckler. In addition to his parents, he was predeceased by his beloved wife of 69 years, Hazel; brothers Norman and Raymond; son-in-law Cecil and nephew Arthur. The family would like to give special thanks to the staff at Melville Heights, and most recently Camp Hill for their care and compassion. A Memorial Service will be held on Thursday, June 1, 2017, 1pm, at Melville Heights, 24 Ramsgate Lane, Halifax, with a reception to follow. Internment in St. John's Cemetery. In lieu of flowers, donations may be made to the Lutheran Church of the Resurrection, Halifax, Creek Hill Cemetery, East LaHave or to a charity of choice. WOLFE, Ronald Eugene (06 Nov 1937 - 25 May 2017) - 79, of Halifax died Thursday, May 25 in the QEII Hospital, Halifax. Born in Milton, Queens County on November 6, 1937 he was the son of the late Russell and Lillus (Anthony) Wolfe. He joined the Navy after high school, retiring in 1982. He is survived by daughters Shawn and Dawn, sister Sandra Turpin of Liverpool, niece Karen Wolfe of Lakeside, Halifax County and nephew Todd Turpin of Orillia, Ontario. He was predeceased by brother Roger. Cremation has taken place under the direction of J. A Snow Funeral Home. 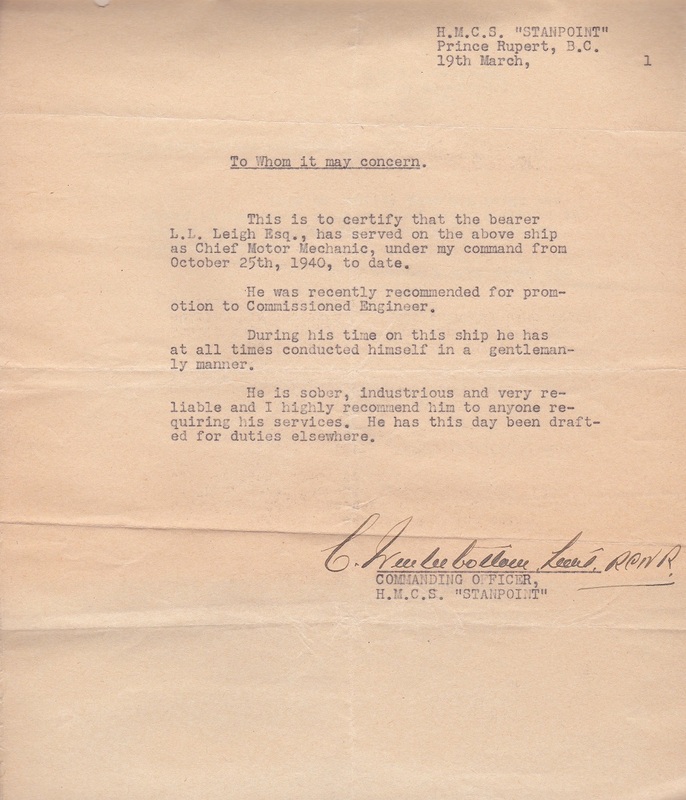 His ashes will be taken to Stadacona for burial at sea. GEDDES, Catharine Verna, TAS, WRCNS (WREN) - 90, Halifax, passed away June 6, 2017, in Saint Vincent's Nursing Home. Born in Strathroy, ON, she was a daughter of the late Harry and Mabel (Finlay) Scott. She was a long time resident of Halifax since 1950. She served in the Women's Royal Canadian Naval Service as a Torpedo Anti-Submarine Rate then as an Administrative Writer. She also worked at Cleveland Industries, and the Victoria General Hospital in Admitting and Bookkeeping, then at Hematology as an office supervisor. She became Secretary of the former H.M.C.S. 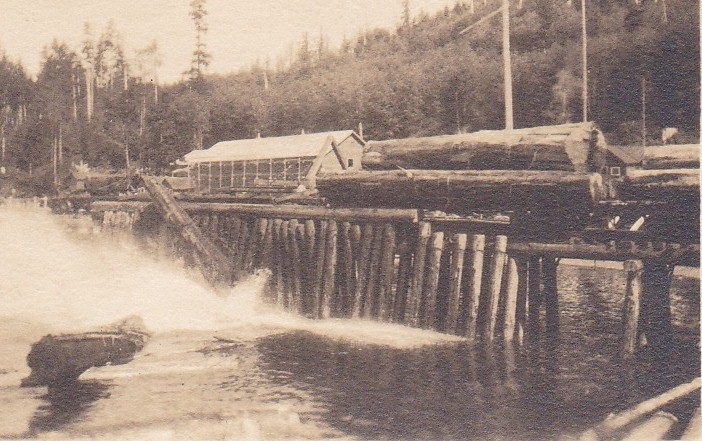 Haida Association (now known as Friends of Haida), and was a member of the Nova Scotia Wren Association, and the Atlantic Chief and Petty Officer's Association. She was a member of Calvin Presbyterian Church. She is survived by her twin daughters Pamela and Patricia (partner Jim Lane) and several nieces, nephews and their families. She was predeceased by her husband Donald and sister Barbara. Cremation has taken place. A private committal will take place at 11am June 12,2017 at St. John's Cemetery and Columbarium, 6 Bedford Highway with Reverend Michael Koslowski officiating. Donations may be made to the Palliative Care Fund or the Chapel Fund of Saint Vincent's Nursing Home, or the Alzheimer's Society of Nova Scotia. Special people in Mom's journey include Dr. Graeme Bethune, Paulette Cromwell, Cindy Shaw, Madeline Bright, Calvin Presbyterian Church Pastoral Care Committee, and Saint Vincent's Nursing Home's caring staff, management, volunteers, and residents. 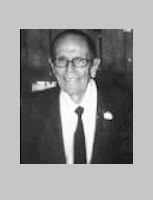 SADDLER, Albert Ernest (06 Oct 1922 0 06 Jun 2017) - It is with great sadness that we announce the passing of Albert Ernest (Ernie) Saddler on June 6, 2017 at Sunnybrook Hospital at the age of 94. Born on October 6, 1922 in Montreal, he was the only child of Fanny Vincent and Ernest Albert Saddler. He is survived by his devoted wife, Grace Margaret Poulton, his three daughters, Carol, Donna (Alan Owler and grandson, Colin) and Janet. Lost to Alzheimer's disease, we would like to thank the extraordinary staff and doctors who cared for Ernie in the Veterans' Wing of Sainte-Anne-de-Bellevue Hospital in Quebec and for the loving and caring staff and doctors who cared for him for the last six years in the K3C Veteran's Wing at Sunnybrook Hospital in Toronto. Everyone who knew Ernie knew a man with a quick smile, a great laugh, and a huge heart. He never refused any request for help and rarely sat still. If not 'puttering' around the house, he could be found in his garden, garage, or workshop, helping a neighbor, or driving a senior to an appointment. 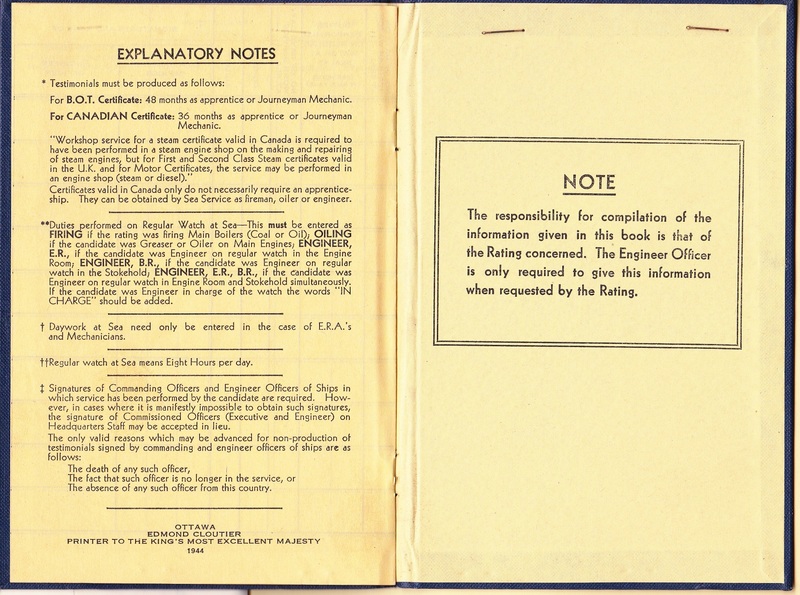 Ernie joined IBM Canada in Montreal in July 1940. 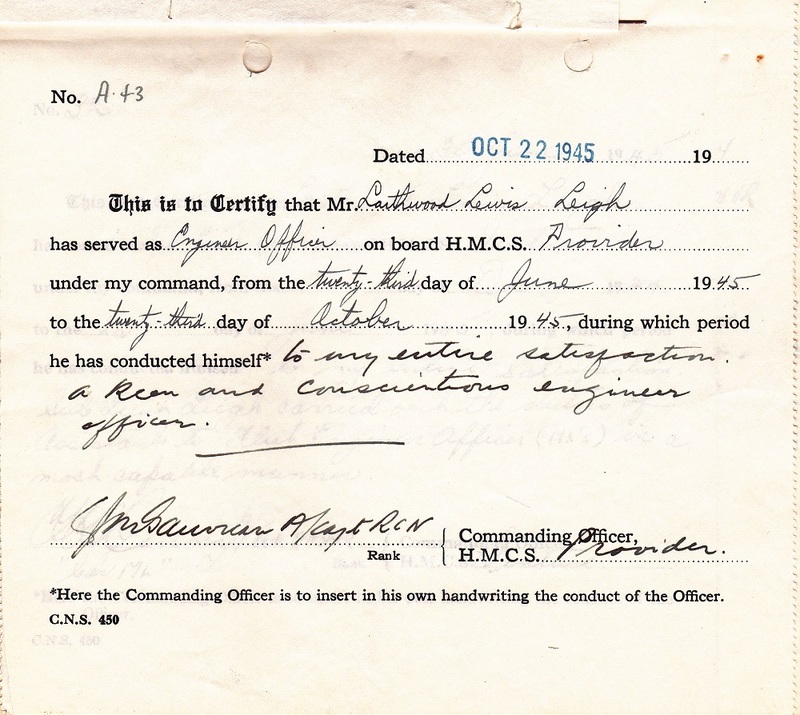 In 1942 he enlisted in the Royal Canadian Navy and was sent overseas. Upon his return, four years later, he met the love of his life, Grace, and within a year they were engaged, marrying on June 12, 1948. He retired from IBM in March1983 after 43 years and, missing the daily challenge, he became the Secretary-Manager at the Royal Montreal Curling Club where he remained for nine years. True to form, still unable to sit idle, and after having been a member of the Royal Canadian Legion since 1947, he became President of the St. Lambert Legion, Branch 68 for six years. He never knew how to do anything, as he would say, 'half-assed' and took on each job full throttle! His daughters could not have asked for a happier home to grow up in, blessed with parents who were a loving team. Rarely apart, they enjoyed doing everything together. With Ernie around, there was always a joke, a song or a hug for Grace and the girls. He was a great storyteller and loved to sing. He always finished every song with a big smile and a 'Boop-boop-deboop'. Diagnosed with Alzheimer's Disease in his seventies, the husband and father his family knew and loved slowly slipped away. Unable to care for him at home any longer, he was moved into the Veteran's Hospital in Sainte-Anne-de-Bellevue. A few years later, to be closer to Grace now living in Aurora, Ontario due to her advancing Alzheimers, he was moved to the Veteran's Wing at Sunnybrook Hospital in Toronto. Our family cannot say enough about the caring staff at both hospitals, who treated Ernie like he was a member of their own family, with dignity and compassion. A special thank you to the K3C staff who went above and beyond for Ernie and his family during his last few days. Please do not forget those suffering with Alzheimer's Disease. They may not remember you, but you know who they are and they would not want to be ignored or forgotten. Friends may call at the Trull "North Toronto" Funeral Home & Cremation Centre, 2704 Yonge St. (5 blocks south of Lawrence Ave.) on Saturday, June 17th for a memorial visitation and reception between 1:00 and 2:00 p.m. followed by a memorial service in the funeral home chapel. In lieu of flowers, donations would be gratefully appreciated by The Alzheimer's Society; Ste. Anne's Hospital Foundation, Sainte-Anne-de-Bellevue, Quebec; or the Veterans' Comfort Fund, Unit K3C, Sunnybrook Hospital, Toronto, Ontario. 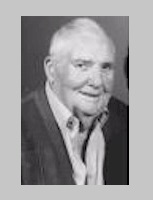 ESSELTINE, Charles Archie - of St. Thomas, passed away peacefully, on Friday, August 10th, 2012, at the Strathmere Lodge, Strathroy, in his 91st year. Beloved husband of the late Clara "Jean" (Crossett) Esseltine (2005) and dearly loved father of Joan (Bill) King of Camlachie, Barb (Charlie) Birdsey of St. Thomas and Rob (Elizabeth) Esseltine of St. Thomas. Dear brother of Marie (Raymond) Cleary and Esther Parker all of St. Thomas. Predeceased by 3 sisters Irene, Alice and Ruby and brothers Bob (Edwin) and Reginald. Dear grandfather Carolyn (Mark Mitchell), Vicki King, Virginia (Carl Bright), Donald (Karen) King, Laura (Evan) Reid, Kevin (Joslynn) Esseltine, Kim (Craig) Harwood and Jennifer Babcock. Sadly missed by a number of great grandchildren. Archie was born in St. Thomas on June 5th, 1922, the son of the late Charles Morgan and Ardellas (Matthews) Esseltine. 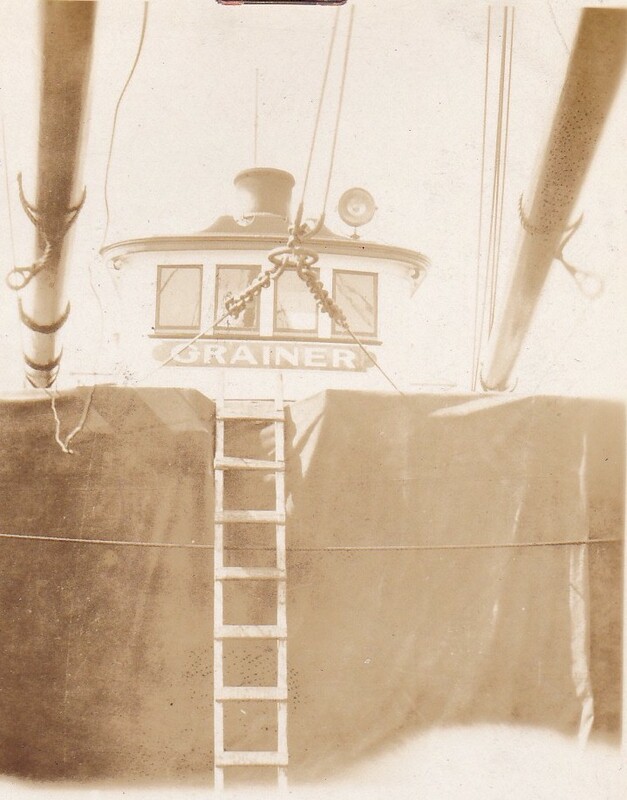 He was a retired crane operator with G.M. 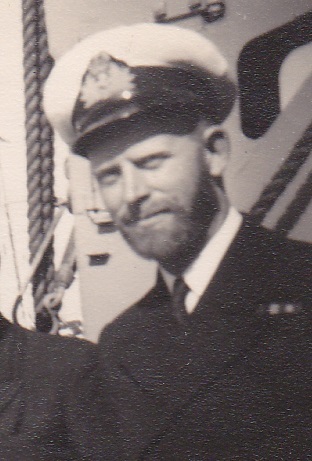 Archie served in the Navy. Resting at Williams Funeral Home, 45 Elgin St., St. Thomas where funeral service will be held Tuesday at 11:00 a.m. Interment to follow in Union Cemetery. Visitation Monday from 2-4 and 7-9 p.m. Remembrances may be made to the charity of choice. 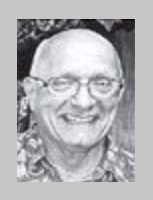 KAYTER, John Andrew - passed peacefully on Wednesday, December 3, 1997, at the age of 74 years. He will be sadly missed by his loving wife of fifty-one years, Noreen. John will be missed by his five daughters, Faye-Marie Kayter, Donna-Mae (Jim) Harvey; Barbara-Joan Miller, Cathy-Anne (Jim) O'Connell and Laura (Jack) Maetche; eight grandchildren, Chad (Erinn) Sehn, Wayne (Susan) Berglof, Dawn (Brian) Williams, Gary Berglof, Jason and Jared Miller, and Hannah and Sarah Maetche. He also leaves to remember him, his brother Martin (Delores) Kaytar and their three children. John's friends, Hanne and Glenn Mason will also miss him. A Memorial Service will be held at the Calgary Crematorium Chapel, 3219 - 4 Street N.W., (within Queen's Park Cemetery), on Monday, December 8, 1997 at 11:00 a.m., with Reverend Prescott Burrill officiating. In lieu of flowers, a donation may be made in John's memory to the Canadian Diabetes Association, 114, 1212 - 1 Street S.E., Calgary, Alberta T2G 0G8. Funeral and Cremation arrangements in care of Heritage Family Funeral Services. McGUIRE, Keith J. (Mickey), Tel, RCNVR (1921-1989) - At the Hamilton General Hospital on Friday, July 21, 1989. Mickey McGuire in his 69th year. Beloved husband of Frances McGuire. Loving father of Gary and Gregory of Toronto and daughter Maureen. Loving step-father of Jane and Paul Ormiston. Much loved brother of Lillian Bailey of New York. Mr. McGuire was a retired employee of Air Canada, with 36 years of service and had served for 5 years in the RCNVR during the WW II. The family will receive friends at the Dodsworth & Brown Funeral Home Mt. Hamilton Chapel, 1020 Upper James St., Hamilton, from 204 and 7-9 p.m. Sunday and Monday. Mass of Christian Burial Tuesday 10 a.m. at Regina Mundi Church, Hamilton. Cremation to follow. Donations tothe charity of you choice greatly appreciated by the family. 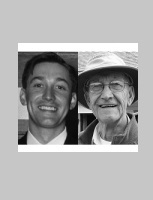 Parish Prayers Monday evening 7:30 p.m.
WILSON, Jeffrey Augustus -died at home in Wilmot, with his family by his side, on June 18, 2017. He is survived by his wife, Betty (Ward), and their combined families - daughters, Erika Wilson (Jean Paul), Laura Wilson (Jamie), Allison Meisner (Brian); son, Michael Harvey (Shirley); and grandchildren, Sophie, Jane, Dana, Kyle and Amber. Jeff worked at his life’s passion doing photography; starting in Bear River; joining the Royal Canadian Navy in the 1960s; then running his own studio in the Annapolis Valley. He was a follower of Bill W. for many years. By his request, his body has been donated to Dalhousie University for Research and there will be no service at this time. Donations in memory of Jeff may be made to Fidelis House, Kentville. 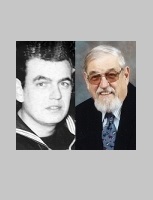 McVEY, S. R. (Kerr), CD, LCdr - Passed away on June 17, 2017 after a lengthy battle with lung cancer at the age of 73. Born in Kilmarnock, Scotland, Kerr immigrated to Canada in 1954 with his parents, the late Robert McVey and Jean Scott Strain, and settled in Toronto. He attended Balmy Beach Public School where under cheerful peer pressure he lost his broad Scottish accent. He attended Malvern High School where he played trombone in the Concert and Dance Bands, the University of Waterloo, and later graduated from Carleton University in Ottawa. 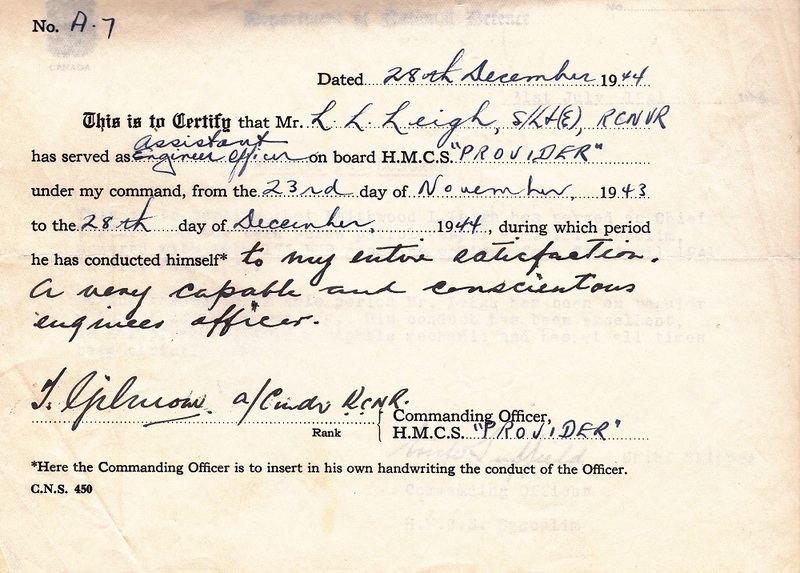 Kerr followed in his father's Royal Navy footsteps and joined the Royal Canadian Navy serving for 30 years with the Navy and Canadian Forces Security Branch. 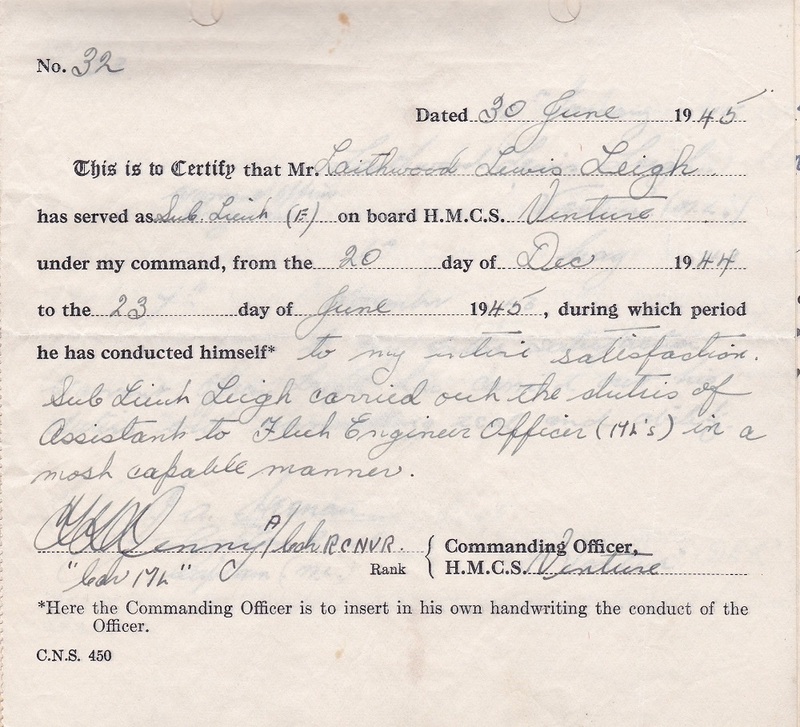 He completed his Officer Training at HMCS Venture and served on HMCS Columbia and HMCS Margaree. 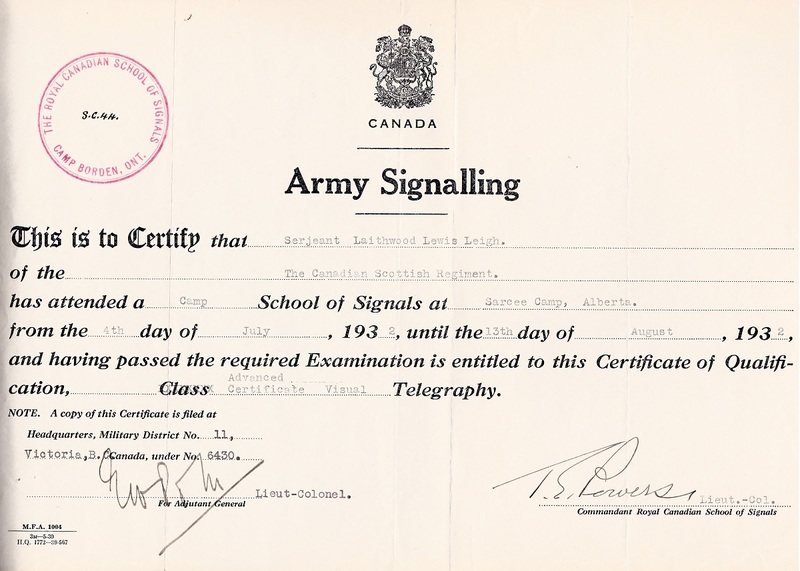 After transferring to the Security Branch, he served at CFB Esquimalt, NDHQ Ottawa, SIU HQ, CFB Halifax, MARCOM HQ and retired as Commander Special Investigation Detachment Atlantic. After voluntary retirement, Kerr was given the opportunity to work part-time with his passion for golf at Golf Central Burnside with Roger and Mary Surette, Kathy Powers and many wonderful staff members. It was the lure of Myrtle Beach -- where he and Betty spent many fun-filled winters -- and winter golf that took him away from his hobby job of twelve years. 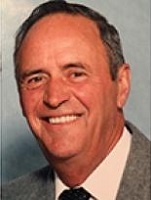 Kerr was an active member of Hartlen Point Forces Golf Club and Oakfield Golf and Country Club. There are a few trophies that bear his name at both courses. Kerr is survived by his loving wife, Betty, of 47 years, his two daughters of whom he was ever so proud, Emergency Physician Dr. Jennifer McVey, Halifax and Assistant Crown Attorney Kerry McVey, Ottawa, son in-law Giuseppe Agnello, and his darling grandsons Saro and Luca. Cremation has taken place and at his request there will be no visitation or service. A private burial service will take place at a later date on Lake Muskoka, Ontario, a place that was so important to him during his teenage years. Many wonderful summers were spent there with the Hogarth family at their cottage. Kerr had a quick wit and a great sense of humour that will be missed by many. The family wishes to thank the many Doctors, Nurses and friends who supported them throughout his last days. 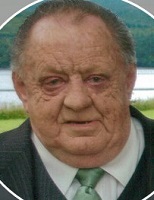 CHANDLER, Wallace Theodore (Ted) - It is with much grief and heartache that the family of Wallace Theodore Chandler, 86, of Chester, Lunenburg Co., announce his passing in South Shore Regional Hospital on Tuesday evening, June 6, 2017 after a sudden and brief illness. Born in Chester, Ted was a son of the late Guilford and Ella (Bond). Ted worked in the Bank of Nova Scotia in Chester for many years with his loving wife, Jacqueline, with whom he shared 63 years of marriage until her recent passing in April. He then had a 30 year career in finance as paywriter in the Royal Canadian Navy until his retirement as Chief Warrant Officer on July 31, 1980. In 1982, Ted received a Member of the Order of Canada medal and, in 2012, the Diamond Jubilee Century of Service Veteran’s Honorary Medallion. He was a very active Chester community member serving as 2nd Vice-President of Royal Canadian Legion, Butler Branch No. 44; President of Chester Golf Club, and Chester Curling Club; Manager of Eleanor Pew Memorial Rink; 23 year term as Treasurer, Chester United Baptist Church; Deacon, Trustee and Treasurer of Anderson Home when a new wing of Shoreham Village Seniors Home was built. Dad contributed this and much more including many turns volunteering. Our Dad was a loving man who was the definition of 'a provider' for his family. He gave us the safety and warmth of a family life as it was meant to be. Although his early years in the Navy took him away from home, we always felt his love and presence. He would bring material gifts home from around the world but the best gift was the return of the Dad we were so blessed to welcome back. We will miss you so much, Dad, and we hope heaven includes the greenest golf course you’ve ever played! He is survived by son, Bradford Kevin, Chester and daughter, Karen Patricia, Timberlea; Karen’s 'partner'/best friend (Ted’s 'Leftie'), Randall Bleasdale; sister-in-law, Patricia 'Patty' Peterson, Chester and brother-in-law, Olaf Peterson; several nieces and nephews, and his newfound love, Sparkle the kitten. Besides his parents, Ted was predeceased by his wife, Jacqueline Muriel (LaFrance); brothers, Donald and Lovett; sisters, Ada, Catherine; several brothers-in-law and sistersin- law; numerous aunts and uncles. There will be no visitation. Funeral service will be held in Chester United Baptist Church, 84 King St. on Saturday, June 10, at 11 a.m. with Rev. Dan Green officiating (including Legion ceremony). Burial will be in Pinehill Cemetery. Following the burial a reception will be held in the church. In lieu of flowers, memorial donations may be made to the Heart and Stroke Foundation of Nova Scotia or Canadian Cancer Society. 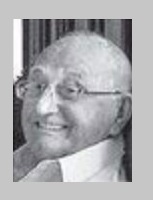 LEADBEATER, Alvin Currie (Al) - passed away peacefully with loving family by his side in Camp Hill Veterans Memorial Building, QEII, in the early morning of June 10, 2017 at the age of 96. Al was predeceased by wife, Dorothy (George) whom he adored. He was also predeceased by his daughters-in-law, Deborah (Bennett) and Joyce (Baxter); brothers, Stuart, Donald and Lloyd. Alvin and Dot were married for 63 years until her passing in 2003, and are survived and lovingly remembered by their children, Robert (Lorraine), Tantallon; George, Spruce Grove; James (Jenny), Nerepis, N.B. ; Bryan, Kingston, Ont. ; Brenda (Pat) Adams, Enfield; Carolyn (Donnie) MacDonnell, Enfield; Donna (Tim) Hines, Whittenburg; numerous grandchildren, greatgrandchildren, great great-grandchildren, and a few 'angels' who went above and beyond to keep him in his home as long as we could who have become his extended family. 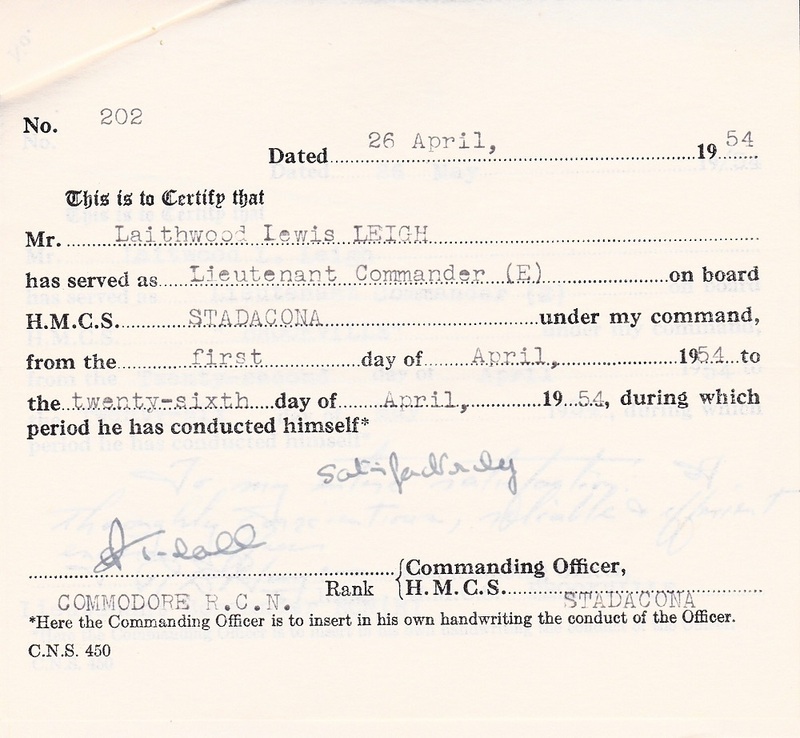 Al was a Veteran of the Second World War with 35 years with the Royal Canadian Navy and served on many ships and later in his career served as Chief Warrant Officer 1st Class at Shearwater Naval Base. 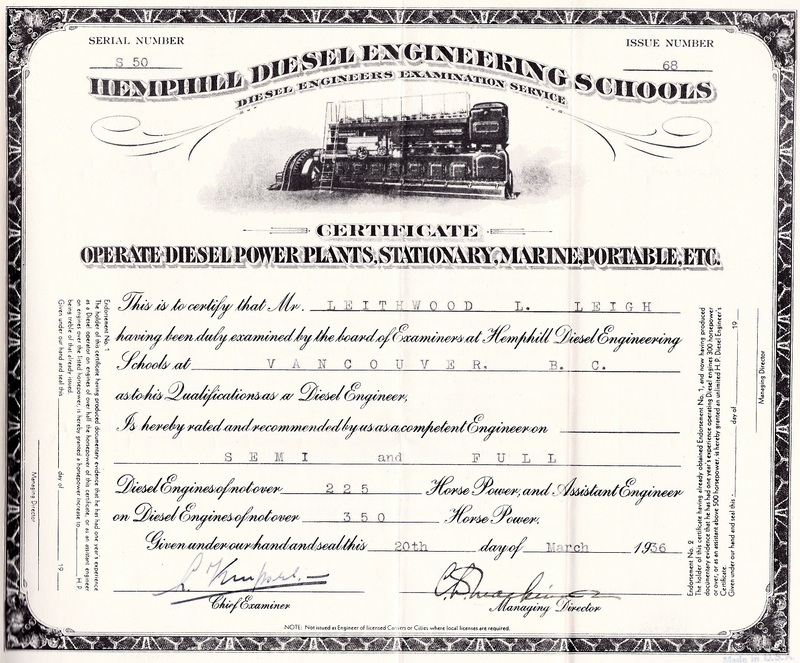 After retirement he earned a teaching degree in Industrial Arts/Woodworking and taught in Halifax. He enjoyed many years as the announcer at the Halifax County Exhibition. 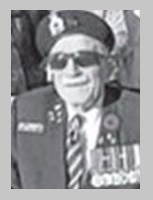 He was a lifetime legion member and held many executive positions including Provincial Zone Commander. His awards and attributes are too long to list as he proudly represented the Veterans in all aspects. He was passionate about the annual poppy campaign and all it stands for. He loved working with his hands and could fix or build anything he put his mind to. He had a large accumulation of parts that 'he may need someday'. He has donated his remains to Dalhousie University for medical education, so a Legion Memorial Service will be held in Branch 133, Enfield, on Thursday, June 15, beginning at 4 p.m. A gathering to celebrate his life will follow the service, refreshments will be served. No flowers by request of the family, any donations may be made to the 6th Floor West of Camp Hill Veterans Memorial Building, QEII as an expression of gratitude for their kind and compassionate care in the last months of his life. Family interment will follow at a later date. SIMPKIN, Laurie A., CD (1921-2017). It is with heavy hearts and profound sadness that we announce the passing of our father, husband, grandfather and uncle. Laurie passed away peacefully in his sleep on June 4, while in residence at Camp Hill Veterans’ Memorial Building, QEII. He was born a son of the late Harry and Mary (Dauphinee). He was the last surviving member of his family being predeceased by brothers, Donald, and John (Muriel); sisters, Mary (Frank), and Gracia (Robert). 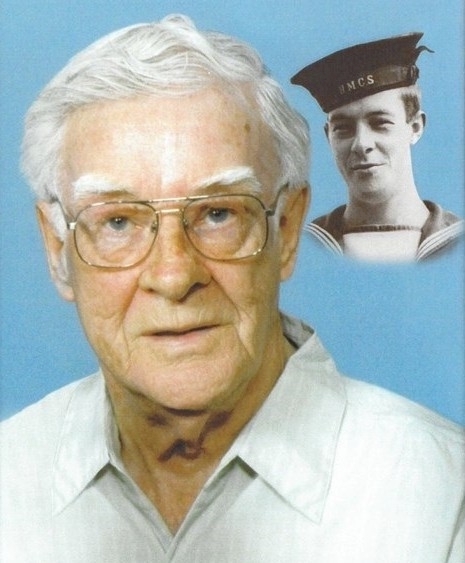 He began his naval career in 1939, retiring in 1960, after achieving the rank of Chief Petty Officer 1st Class. 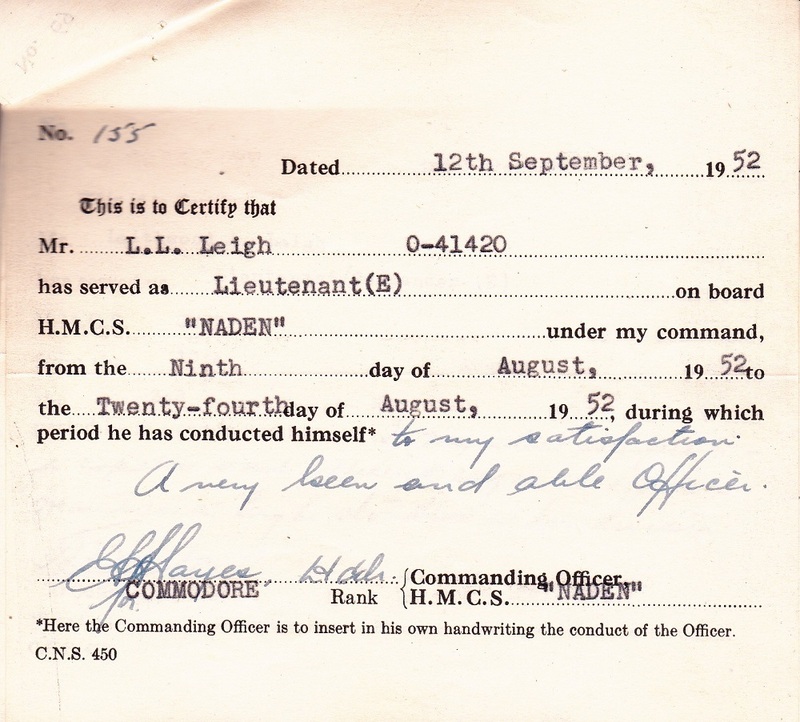 He was a Veteran of the Second World War. Laurie was an avid sports fan, huge follower of the Toronto Maple Leafs and Blue Jays. He loved music and was a member of the Church Choir at St. Michael’s Parish, where he served as a Eucharistic Minister. He was a member of the Chebucto Community Singers and a Knight, with the Knights of Columbus. He loved to play the harmonica and the ukulele and could sing along with any song from yesteryear. Laurie was first and foremost the loving husband to his devoted wife, Dorothy (Sleigh) for 76 years. He is survived by Dorothy and their children, Don (Sandra), David (Linda), Denis, Nancy Laphen (Steve), Diana Fisher (Mark); 12 grandchildren and 12 great-grandchildren and several nieces and nephew. A special thank you to the phenomenal care Dad received from the staff on V5 Garrison West and the private care given by Tracy Potter, Physio and Mary MacKay, Footcare. Cremation has taken place. Visitation Thursday, June 15, from 7-9 p.m. in J.A. Snow Funeral Home, Halifax. Funeral Mass will be Friday, June 16 at 11 a.m. in St. Michael’s Church, Spryfield. Donations in memory made to the Alzheimer Society of Nova Scotia, or the charity of choice. Family flowers only. 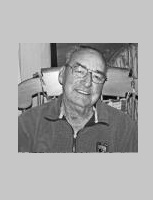 HURDIS, Gerald (Gerry) - 76, Halifax, passed away suddenly May 31, 2017 in Camp Hill Veterans’ Memorial Building, QEII. Born in Carleton Place, Ont., he was a son of the late Jack and Freda (Carter) Hurdis. 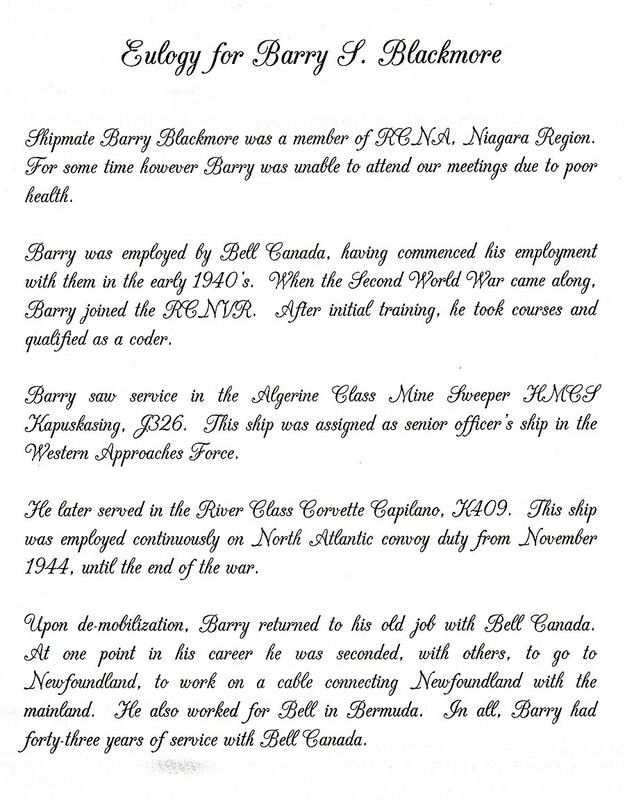 Gerry served 33 years in the Royal Canadian Navy as a cook. He had a passion for country music, antique cars, animals, and spending quality time with his family, especially his grandchildren. He will be sadly missed by all who knew and loved him. He is survived by his loving wife, Agnes, Cole Harbour; daughters, Charlotte 'Sherry' (Peter) Lightfoot, Canning; Jeannie (Lloyd Ralph) Cromwell; son, Brian (Jessica) Hurdis, all of Cole Harbour; grandchildren, Theresa 'TJ', Tamika, Chantal, Michel, Austin, Addison; three great-grandchildren; sister, Janet (Bryan) Drynan, Ontario; nieces, Donna, Brenda; nephew, Randy. Cremation has taken place under the direction of Cole Harbour Funeral Home, 1234 Cole Harbour Rd. A memorial service will be held 2 p.m. Thursday, June 8, in the funeral home chapel. Interment in Dartmouth Memorial Gardens. Reception to follow in Royal Canadian Legion Centenial Branch. Donations in memory may be made to Royal Canadian Legion Centennial Branch. RUTLEDGE, Wendell Vaughn - 90 of Eastern Passage, passed away May 25, 2017 in Camp Hill Veterans’ Memorial Building, QEII, Halifax. He was born in Amherst, May 11, 1927 to the late Edward and Olivia (Tucker) Rutledge. He is survived and greatly missed by wife, Gloria (Hilchey) Rutledge; daughter, Wendy Heuston; granddaughter, Andrea Lothian; sisters, Marjorie Evans and Marie Barker; sister-in-law, Roberta Rutledge and many nieces, nephews and grandchildren. He was predeceased by brothers, Douglas, Chester, Vincent, Ronald, Frederic and sister, Irene. 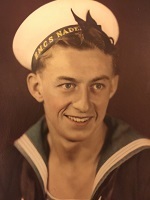 Like his father before him and all eight siblings, Wendell joined the military, enlisting in the Canadian Navy in 1950. Wendell served in the RCN and Public Service for 35 years. Cremation has taken place, and by his wishes, there will be no service. A family interment of ashes will follow at a later date. Memorial donations to the Canadian Cancer Society or animal rescue group of your choice would be greatly appreciated. 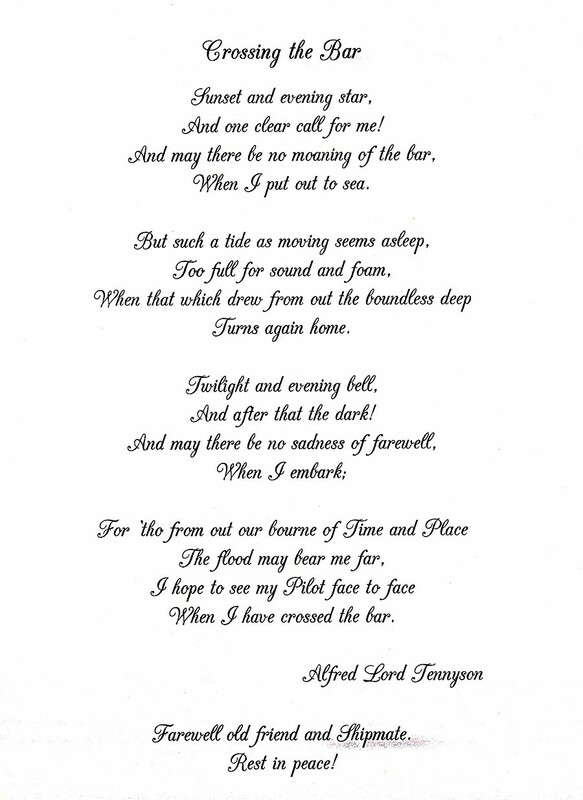 PARIS, Arthur Thomas (Art) - It is with broken hearts we announce the sudden passing of our husband, father and grandfather (“Pepe”), following a brief illness, at home on May 22nd. Born on November 2nd, 1928 in Mitchell, Ontario, he was a son of the late Jack and Rae Paris, and stepmother Iva Paris. 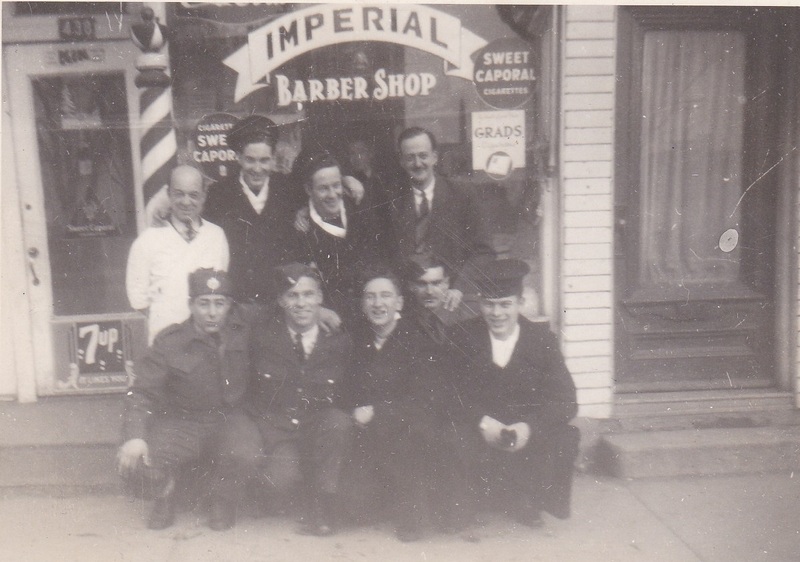 Art grew up in Mitchell, moving to Halifax and joining the Navy in his early 20s. A proud Veteran, he played the French horn in the Stadacona Band. He met the love of his life, Marie, on a blind date and they married in 1951. After retiring from the Navy, he went on to work at Via Rail in various roles, from the dining room to the sleeping cars, then as an Inspector, until his retirement in 1989. He loved reading, history and music and he could often be found cooking in the kitchen while listening to big band music. He enjoyed spending time with family, taking in the bands at the Public Gardens and completing his weekly Lexicon. He and Marie loved spending time at the Casino, where they enjoyed socializing more than anything else. He was truly one of a kind; a classy, honorable, patient and kind man, who loved and was loved by so many. The world will never have another Pepe. Art is survived by his loving wife of 65 years, Marie Paris (Dauphinee), daughters Judy (Bob) Powers and Donna (Gary) Keddy; grandchildren Terri (Jason), Jennifer (Lee), Kyle (Courtney), Jeff (Lindsay), Jason, Kevin (Sarah) and Kelly; great grandchildren Cayden and Cooper; sisters Jean Mullenix and Joyce Cameron. ; sister-in-law Barbara Landry and many nieces and nephews. He was predeceased by his parents; brother Bob; sister Evelyn; nephew Bobby; brothers-in-law Vincent Landry, George Dauphinee, Alec Cameron and sister-in-law Lorena Paris. There have been many people in his life who have helped him through the past few months - Dr. Craig St. Peters; special neighbors Ron and Linda, Hugo and Vera, and Carol; his caregivers who have become close to our family, Nora and an extra special thank you to Sonya for everything she did for him and for being with him until the very end. We would also like to thank the staff at Casino Nova Scotia for always treating him so well. We are so grateful that he had so many special people in his life. Cremation has taken place. Visitation will be held Friday, May 26 from 2-4 and 7 - 9 in Atlantic Funeral Home, 6552 Bayers Road, Halifax. A memorial service will take place on Saturday, May 27 at 4pm at Atlantic Funeral Home, 6552 Bayers Rd. Reception to follow. In lieu of flowers, donations may be made to the Head & Neck Cancer Patient and Family Fund #T-751 c/o QE II Foundation Office, 1276 South Park Street, Halifax, N.S. B3H 2Y9. 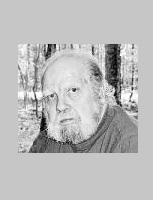 GRUNDY, William Albert (Bill) - 76, of Truro, “Bugs, VE1AHG”, passed away May 22, 2017, peacefully, after a heroic battle with cancer. His daughters and partner were by his side. Bill was born in Hamilton, ON. 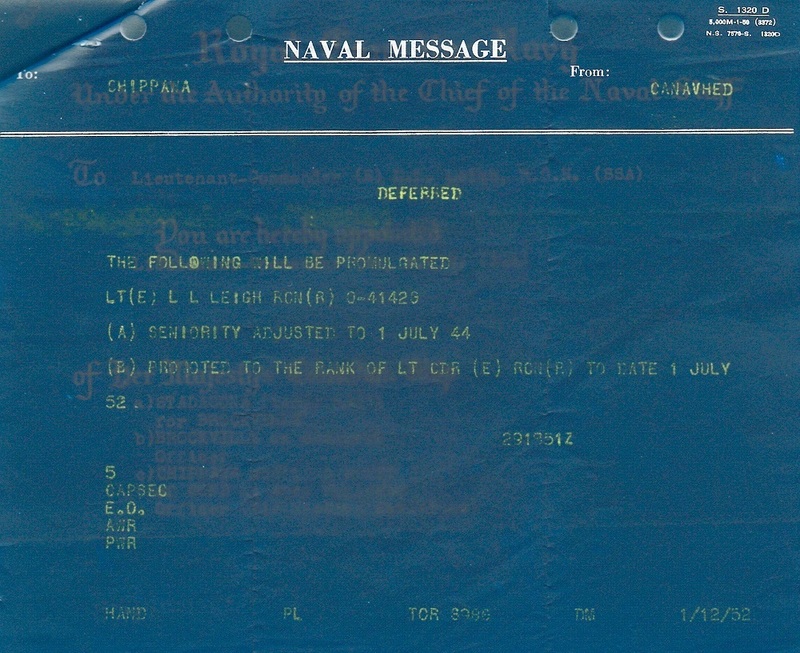 February 15, 1941. He was the son of the late Violet Mae (Brill) and William Radcliff Grundy. He is survived by his girlfriend, Norma Jean MacAloney; his two loving daughters, Dawn Holmes (Bruce) Shelburne, and Cathy Weatherby (Wade) Truro; grandchildren Carrie (Tanya), Katie, Kaysha, Brittany, Kamaya, Emma, Alex; great- grandchildren Karome, Stephen, Kai; first wife (28 years) Helen Archer (Donald); brother Clifford, sisters Isabel, Wendy, Judy. 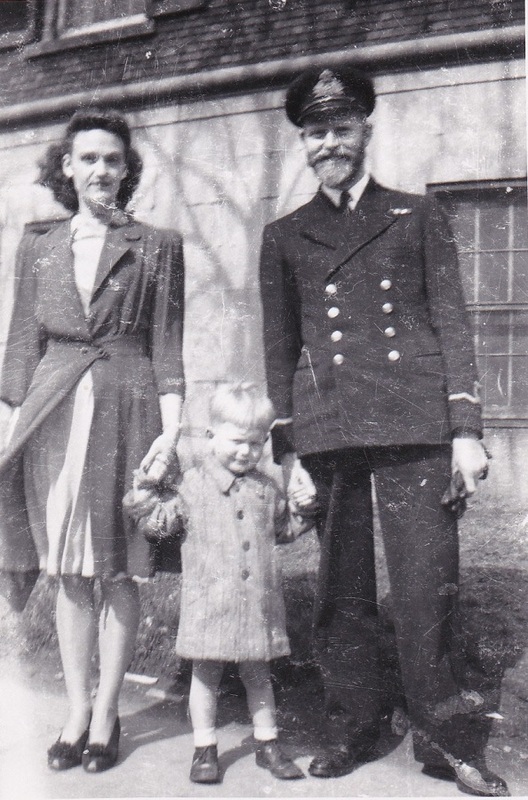 For 10 years he was a Leading Seaman, Communications Operator in the Royal Canadian Navy. The next ten years he was an Electronics Shop Teacher at the Shelburne Regional Vocational school. He retired at Colchester Regional Vocational school as an accomplished and well liked Electronics, Math, Science and Computer Teacher. Bill loved spending time with family, was a Founding Member and long -time President of the Miniature Aircraft Society and Wings Instructor, built his own home, enjoyed photography, reading and Sci-fi, and having a good political debate. A celebration of Bill’s life and visitation will be held at Colchester Community Funeral Home, 512 Willow Street, Truro on Saturday May 27th, from 2pm-4pm (visitation, informal service, reception). We would like to thank Dr. Robert Graham, Dr. Mary Keeting, special nurse Darlene Deveaux, VON, Palliative Care, Truro Hospital Nursing staff. Donations may be made to the Miniature Aircraft Society of Truro. 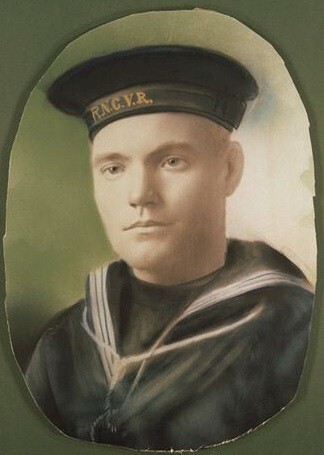 WESSON, Albert William - of Eastern Passage. `It is with great sadness that we announce the passing of our father, Albert William Wesson, on April 25, 2017, in Camp Hill Veterans’ Memorial Building, QEII, in Halifax, where he was residing. Dad was born in Ottawa, Ont. in 1927, the second son of the late Jack and Ada Wesson. 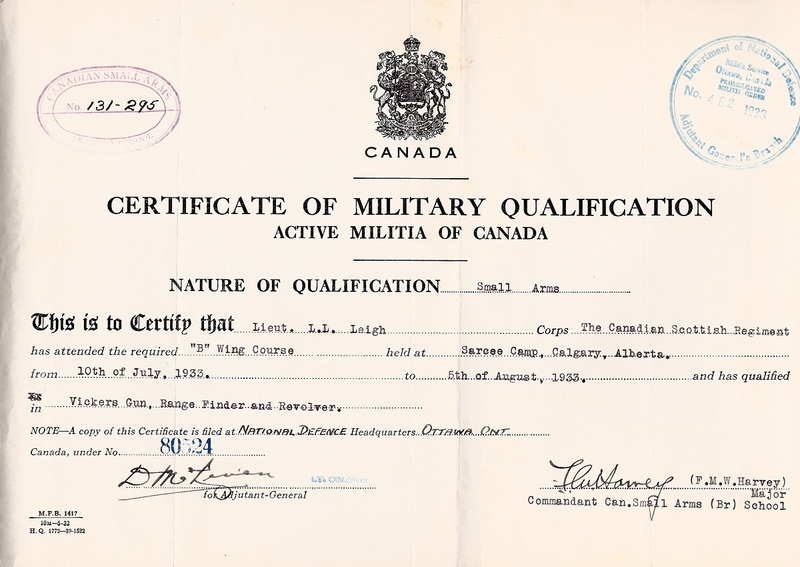 While training with the RCNFAA during the Second World War, he met and fell in love with Edith Higgins. Mom and Dad married in 1949 and made their home in Eastern Passage, until her passing in 1996. 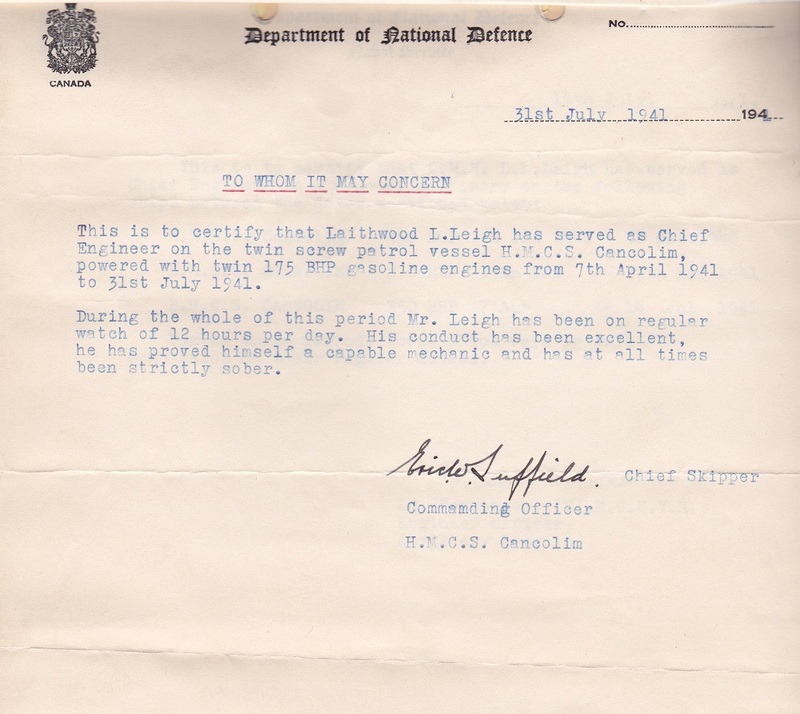 After Dad’s service with the RCNFAA, he worked with Fairey Aviation and IMP as an aircraft mechanic. Upon his retirement, he was the Personnel Manager for IMP. Dad was predeceased by his only sibling, Leslie. In recent years, Dad was a fixture along the Shore Road and Boardwalk in Eastern Passage, where he would walk no matter the conditions, making his daily trek to Tim’s for two of his favorites things, his Iced Capp and blueberry muffin. Left to mourn are his children, Cathy Wesson (Derek Pepler) and Paul Wesson (Roxanne Myers). Dad was know as Gandy to his grandsons, Ryan Pepler (Kelsie) and Cale Pepler (Kristen) and his 'little guy', great-grandson, Riley Pepler. Also many nieces and nephews. We would like to thank the staff, nurses and doctors at the Veterans Memorial Hospital for their care and patience. Private service and burial has already taken place. Donations can be made to Hope for Wildlife or local SPCA. 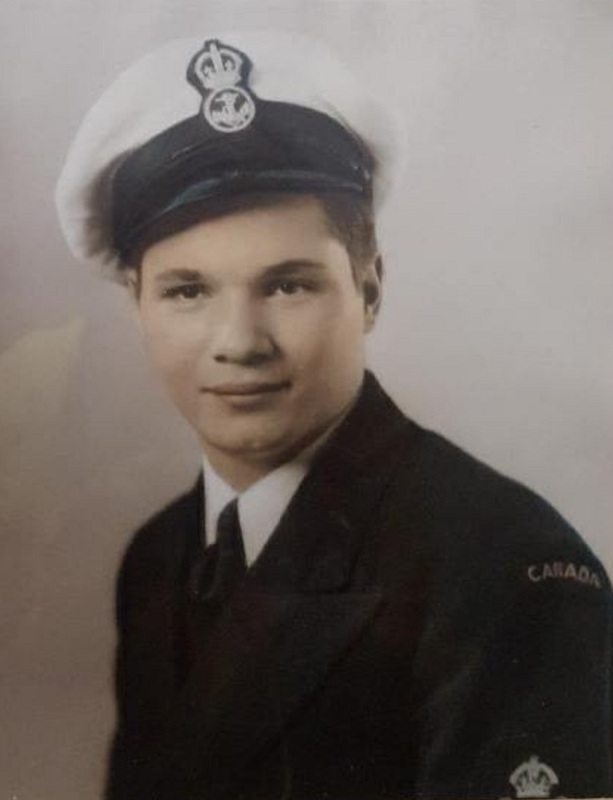 BIDNOCK, Michael - age 95 of Dartmouth, formerly of Yorkton, Sask., passed away peacefully in Camp Hill Veterans’ Memorial Building, QEII, Halifax on Monday, April 10, 2017 surrounded by his family. Mike was born March 20, 1922 in Estevan, Sask. He served his country in the Canadian Navy (1942 - 1967). was an avid golfer, swimmer also loved to cook. 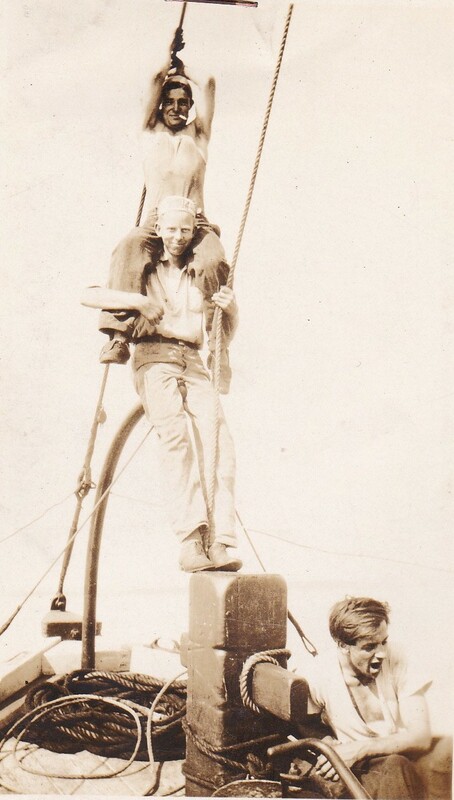 He was Maritime Diving Champion of the navy the late 40’s. He was a lifelong of the Legion and The Chiefs and Petty Officers In 2001 he was inducted into the Yorkton Sports Hall of for swimming, diving, track field, bowling and golf. He also the Canadian Master Swimming Championship in 2004. Mike survived by his wife, Winnie; son, (Kim) and stepchildren, Steven Cindy), Carrol (Gordy) Joy (Michael) Gary and several grandchildren and great-grandchildren. has taken place under direction of Dartmouth Funeral By Mike’s request there will no service. The family would like thank the staff of 6th West Camp Veterans’ Memorial Building, Halifax, for their excellent care Mike during the last two years of life. BLACKMORE, S. Barry, V55618, Coder, RCNVR - Peacefully on Thursday, June 13, 2002 at his residence. 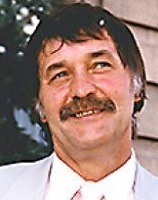 Barry Blackmore loving husband of Barbara Louise, loved father of Hilary and Graham Greene of Udora, Liz and Bill Winders of Canonsburg Pa., Chris at home, dear papa of Max Winders, One of 13 children Barry is now survived by his sister Edith Teasdall and brother Vincent Blackmore both of White Rock B.C. Also survived by numerous nieces and nephews. Barry was a member and a Eucharistic Minister of Star of the Sea Church, Veteran of WWII serving with the RCNVR, a member of the Royal Canadian Naval Association, a Life and 50 year member and Past President of the Royal Canadian Legion Port Dalhoiusie Branch # 350, was a zone Commander of Zone B-5 with the Legion, Knights of Colombus Council # 1394 for 50 years, worked with Bell Canada for 43 years. Barry is resting at the George Darte Funeral Chapel 585 Carlton St. until Monday at 10:30am. Funeral Liturgy will be celebrated at Star of the Sea Church at 11:00am. Cremation to follow. Vigil prayers for the deceased will be held in the funeral home on Sunday at 8:30pm A Legion service will be held at the funeral home by members of the Port Dalhouse Branch of the Royal Canadian Legion and the Royal Canadian Naval Association on Sunday at 7:00pm. Visiting hours Sunday 2- and 7-9pm. Memorial remembrances to the Alzheimer's Society or a charity of your choice would be appreciated by the family. Our grateful thanks to the Linhaven Adult Day Care Program and the Alzheimer's Society, for their caring and support of Barry on his journey. 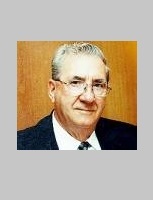 BLAKELY, Arthur W., V38893, Tel (S.O. ), RCNVR - died: 09 Jul 2006. 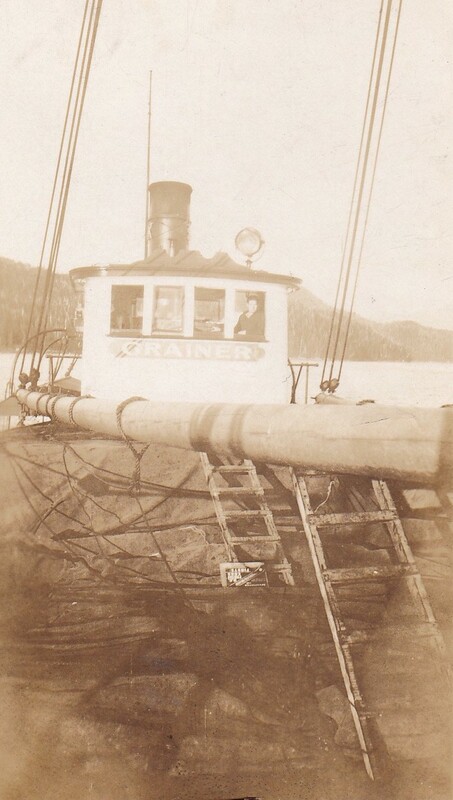 Arthur served at Gordon Head W/T Station and NRS Masset. BOCKUS, Donald Roland, A4117, Chief Stoker, RCN(R) - At Welland County General Hospital on Monday, February 11, 2002, Donald Bockus of R.R.#2 Welland, in his 88th year. Beloved husband of Lia (Lehnert) Bockus and loving father of Elaine and her husband Norman Gill of RR #3 Wellandport, Richard Bockus and his wife Diane of St. Catharines, David Bockus and his wife Leslie of RR#2 Welland. Also loved by his grandchildren Shelley and her husband Dale Osborne of Englehart, Ontario, Ron Gill of RR3# Wellandport, Brian Bockus of Englehart, Cheryl and her husband Herven Loisel of Welland and Jeremy Bockus of RR#2 Welland and great-grandchildren, Sara Osborne, Jonathon Loisel, Justin and Brandon Bockus. He was predeceased by his brother Herbert. 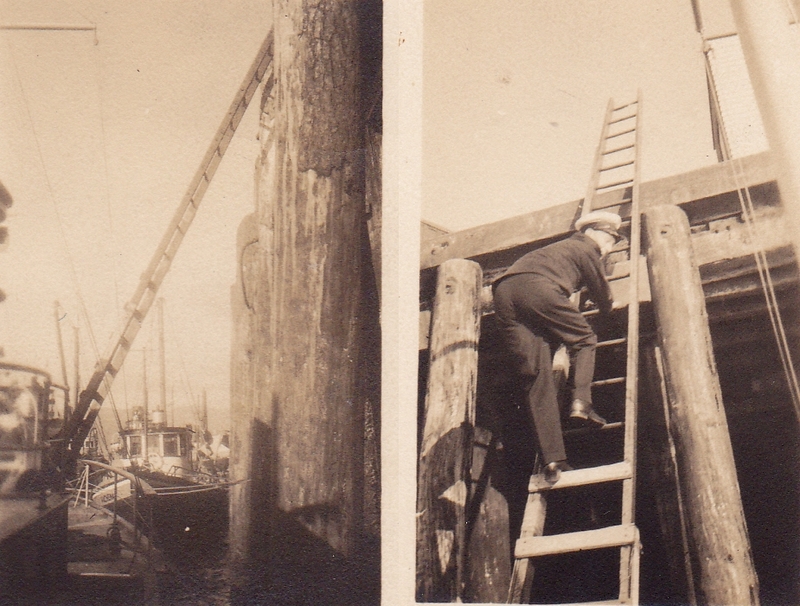 Donald was a marine engineer with N.M. Paterson and Sons on the Great Lakes, both before and after WWII. 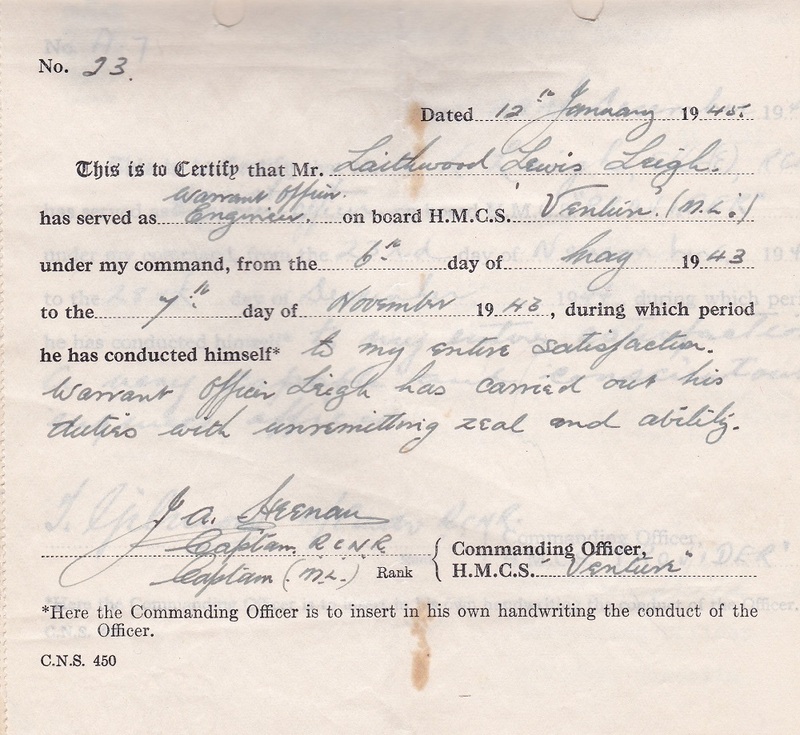 He was a WWII veteran who joined the Navy (RCNR) in 1939 and served on several ships throughout the war at sea. 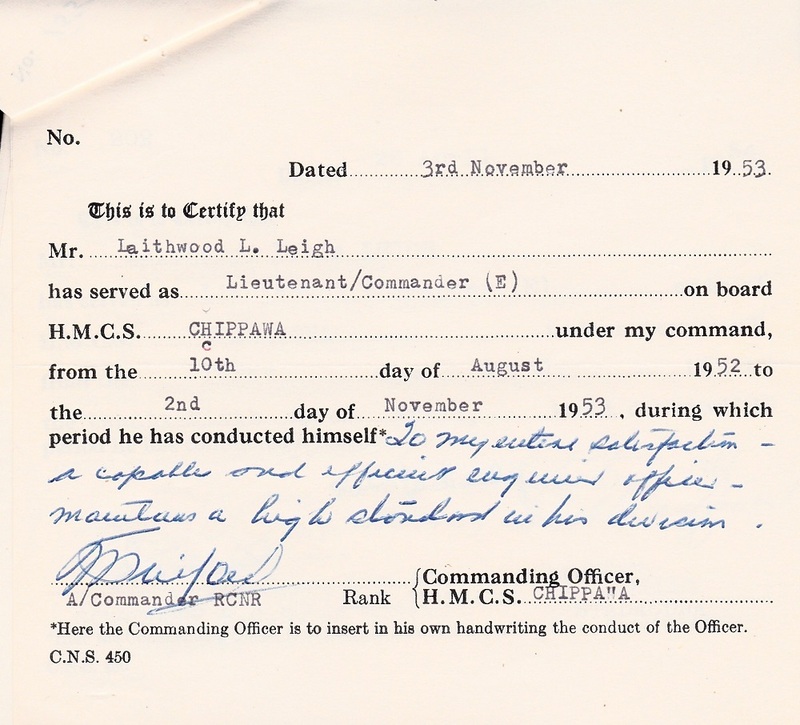 His ship participated in the D-Day landing. 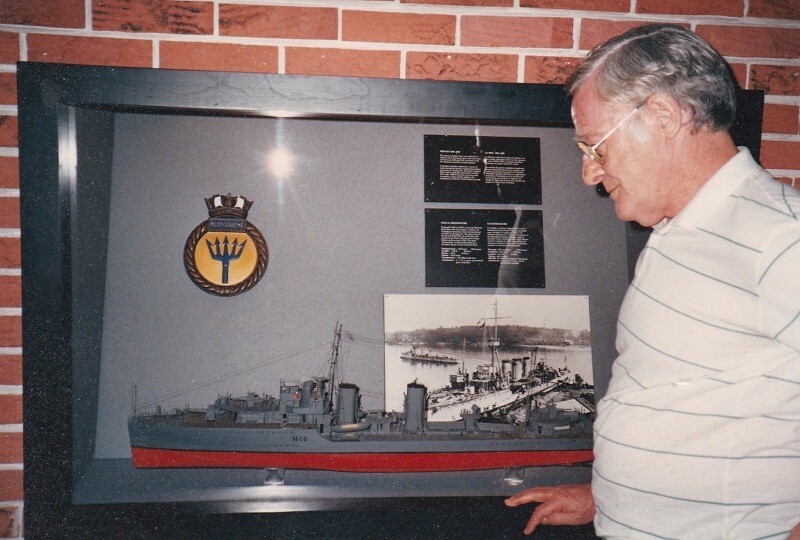 Donald was a member of the Royal Canadian Naval Association, Niagara, as well, he was a member of Myrtle Lodge #337 AF & AM Port Robinson and recently celebrated 50 years of masonry. He was a dedicated man that went quietly about his work. Friends will be received by the family Tuesday, February 12th, 2-4 & 7-9 pm. at the James L. Pedlar Funerl Home, Dixon Chapel, 1292 Pelham Street, Fonthill, Ontario where the complete funeral service will be conducted in the chapel on Wednesday February 13, 2002 at 11:00am. Cremation to follow. As an expression of sympathy, donations may be made to a charity of your choice. Members of the Myrtle Lodge #337 AF & AM Port Robinson will hold a memorial service at the funeral home Tuesday evening at 7 pm, sister lodges are invited followed by the Royal Canadian Naval Association Niagara memorial service at 8pm. CORNELL, Winfield Duncan (Winn), OS, Combined Operations, V4918, RCNVR (served 13 Mar 1942 - 22 Oct 1945) (16 Dec 1923 - 18 Nov 2006) - At the Greater Niagara General Hospital on Saturday November 18, 2006, in his 83rd year. Winfield Duncan Cornell beloved and devoted husband for 60 years of Phyllis (Willick) Cornell. Loved father of Jody Watson (lee), Donald Cornell (Patricia), Deborah Prychidny (Walter). Loving grandfather of Shawn, Joel and Hope Watson, April Tyrrell, Alicia Boake, Aaron and Adam Prychidny. Also surviving are 8 great-grandchildren. Resting at the funeral chapel of Hetherington and Deans, 5176 Victoria Ave. where the family will receive visitors Tuesday 2-4 and 7-9. The funeral service will be held at Chippawa Presbyterian Church on Wednesday November 22, 2006, at 11 AM. Interment Lundy's Lane Cemetery. As an expression of sympathy contributions to The Ontario Heart and Stroke Foundation would be appreciated by the family. On Tuesday afternoon the Royal Canadian Naval Association will hold a memorial service in the Chapel at 2:30. FAGAN, Alvin Harland., PO ERA, V36511, RCNVR - On Sunday December 18, 2005 Al passed away peacefully at the Greater Niagara General Hospital at the age of 86 years. Cherished husband of Mary for 61 years. Loving father of Doug (Linda), Wayne (Janet), Craig and Vickie Fagan. Proud grandfather of Randy, Nathan, Elise (John), Tiffany (Mark), Mary Beth, Heath and Jack. Great-grandfather of Lucas. Dear brother of Ella (Caesar), Ray (June) and Bruce (Bernie). He will be fondly remembered by many nieces and nephews. Al was predeceased by his daughter Wanda Diane. 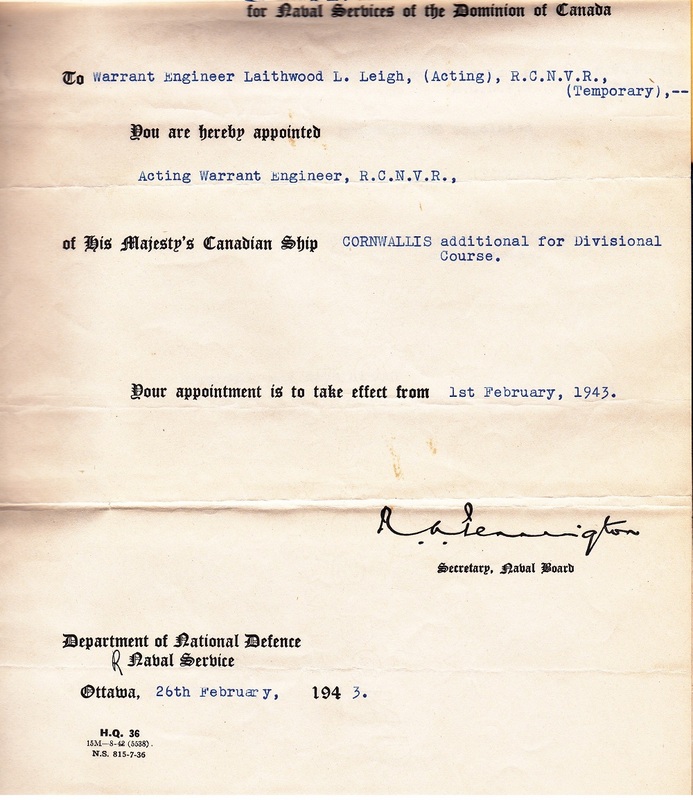 Al served in the R.C.N.V.R. and was a retired customs officer with Canada Customs. He was well known for his involvement with community organizations such as the Royal Canadian Legion, Branch #479, a Past President of the Niagara Falls Golden Central Club, President of the local Customs Union and the first Life Member of the National Customs Excise Union and Dounes Accise (C.E.U.D.A. 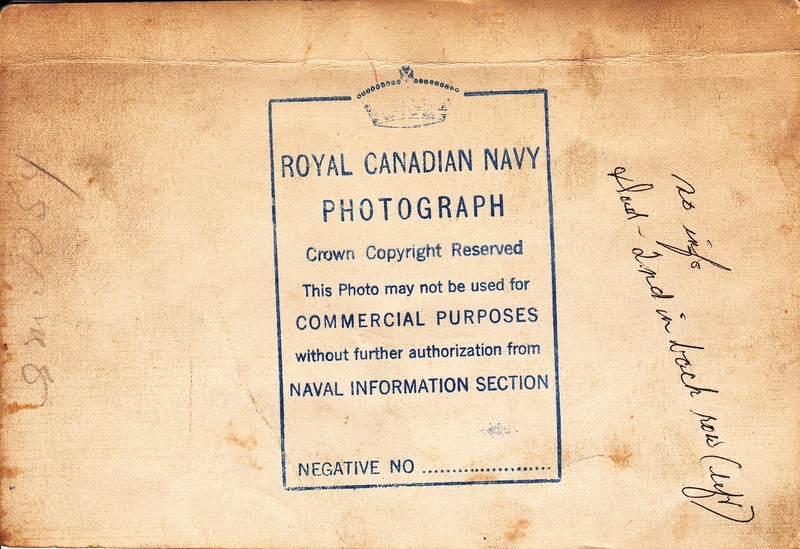 ), and a member of the Royal Canadian Naval Association. Al will be remembered for his very active involvement in politics as well. Al is at the Morse & Son Chapel of the Morgan Funeral Homes, 5917 Main Street. His family will receive friends on Monday and Tuesday from 2-4 and 7-9 p.m. Funeral service to celebrate his life will be held at the funeral home on Wednesday at 11 o'clock. Interment will follow at Fairview Cemetery. Memorial contributions in his memory may be made to the Greater Niagara General Hospital Foundation or to the Niagara Falls Boys and Girls Club. 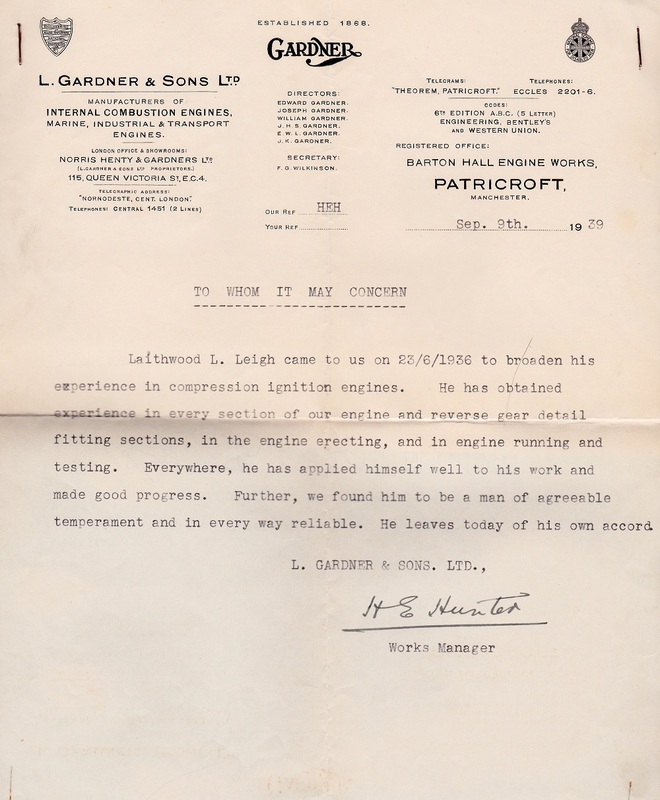 GOODMAN, Lawrence Holloway, L/Sig, VR-1598, RNCVR - of Jordan, ON. Born 19 Jul 1902, St Catharines, ON. Year of passing unknown. 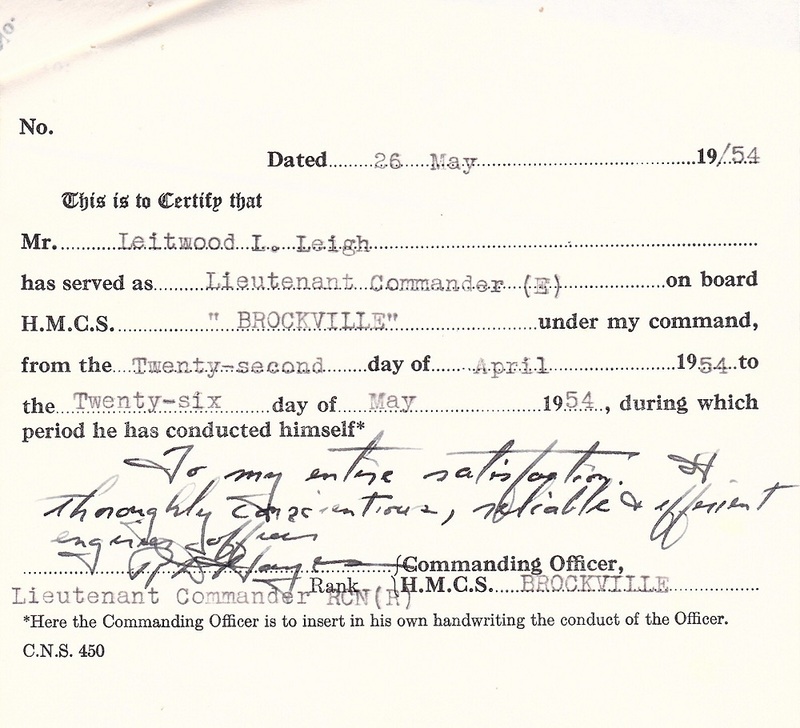 He lied about his age to enlist as his service records show his year of birth as 1900. DeLaFRANIER, Lawrence James (Jim, Jimbo) (18 Oct 1922 - 21 Jun 2017) - Peacefully, at Peterborough Regional Health Centre, on Wednesday, June 21, 2017 aged 34,580 days. Beloved husband of the late Katherine (née Woodland). Loving father of Brenda Nason (Gary) and Lucy Dawson (Peter). Proud Bumpa of Christine Cleghorn (Tommy) and Katie Dawson. Great Bumpa of Dustin and Natasha Cleghorn. Great Great Bumpa of Easton Cleghorn. 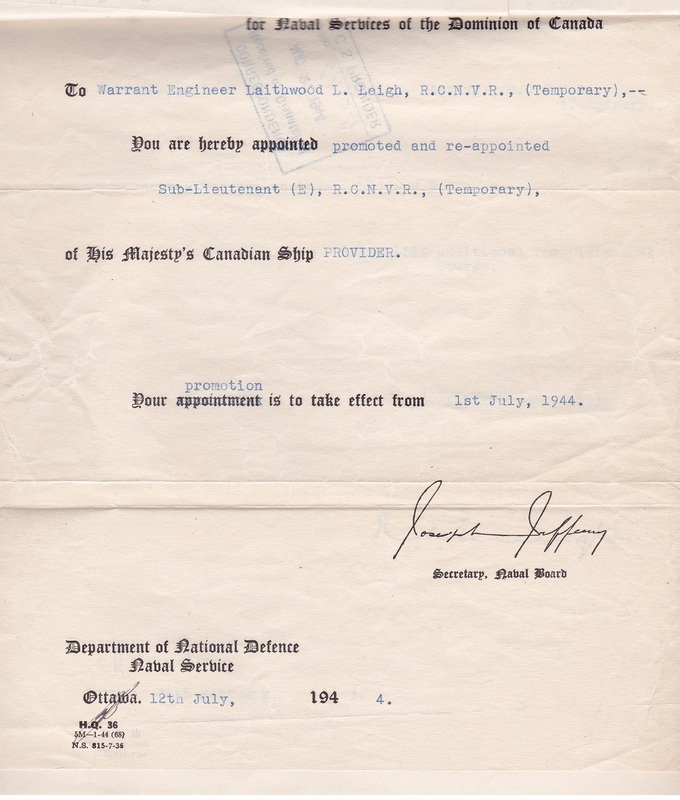 Dear brother of Lucille Brunt (Douglas), and predeceased by his brothers William (Joyce), Jerry (Margaret), Robert (late Margaret) and John (Carol). Sadly missed and lovingly remembered by many nieces, nephews, relatives and friends. 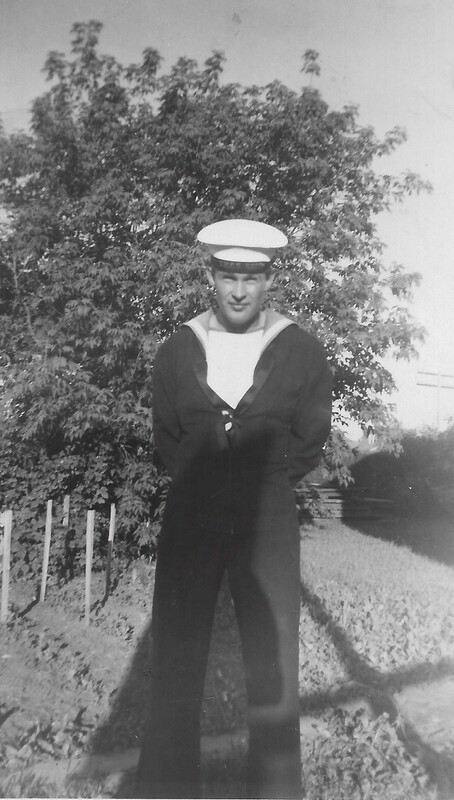 Jimbo was a WWII veteran proudly serving in the Royal Canadian Navy from 1939-1945, aboard HMS Campbeltown and HMCS Malpeque. A long time employee of Canadian Tire as a head buyer, he retired at the age of 46 to spend his golden years golfing, fishing and gambling. A generous and giving man, a kind and gentle soul, Jim never had a bad word to say about anyone. The family will receive friends on Friday, June 23 from 6:00 p.m. to 8:00 p.m. at Comstock-Kaye Life Celebration Centre, 356 Rubidge Street. Mass of Christian Burial will be held at Immaculate Conception Church, 386 Rogers Street, Peterborough on Saturday, June 24, 2017 at 11:00 a.m. A private family interment will be held at a later date. In lieu of flowers, donations to PRHC Emergency Care or St. Joseph's at Fleming Foundation would be greatly appreciated by his family. Special thank you to the Emergency Room staff and nurses; especially Lynn, Casey, Jane and Danielle; the fourth floor nurses Melanie and Taylor; and the amazing staff at St. Joseph's at Fleming. COOK, Robert Richard (07 Dec 1924 - 19 Jun 2017) - It is with deep sadness that we announce the passing of Robert (Bob) Cook at Deer Lodge Centre on Monday, June 19, 2017. He was born in Brandon, Manitoba on December 7, 1924. Left to cherish many fond memories are his daughter Sandra (Bill); grandsons Fr. Darren and Brent (Kelly) Kawiuk; stepsons Ted and Dale (Donna), as well as step-grandsons Tom and Patrick Robbins. He was predeceased by his dear wife Doreen; his parents and three sisters. 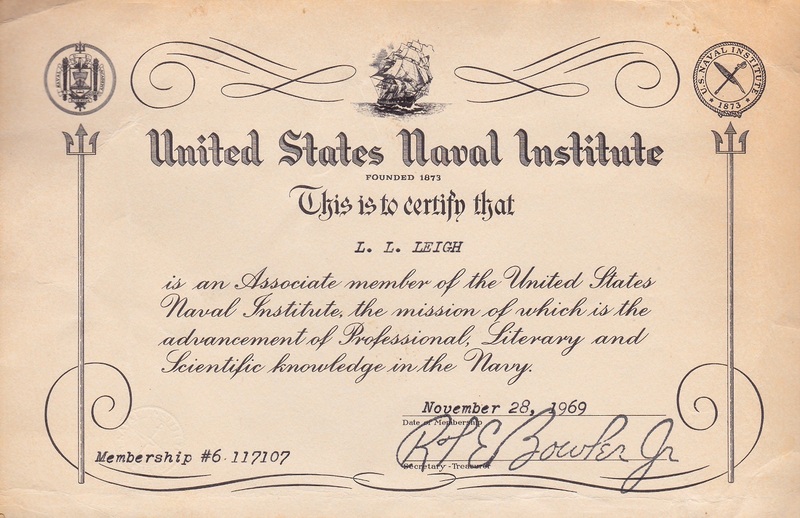 Dad served in the Navy during W.W.II and had various careers. 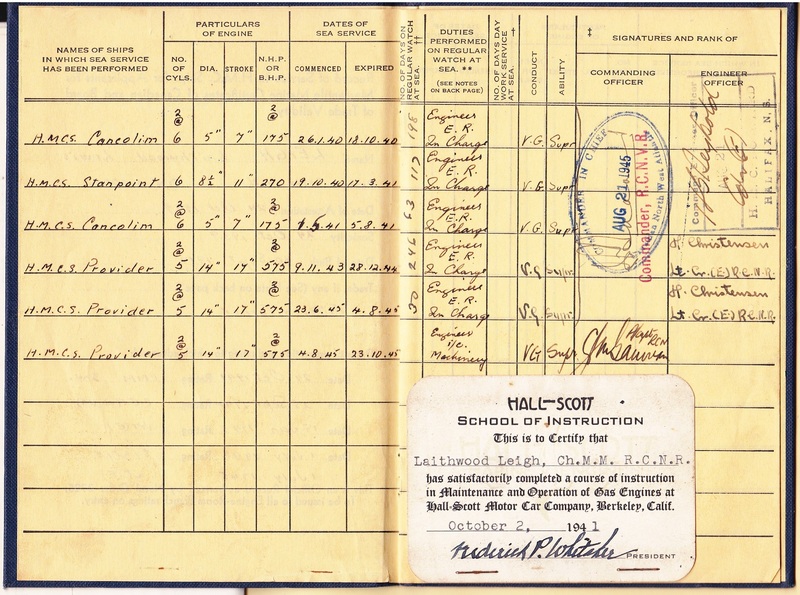 Upon his retirement, he and Mum loved to travel and would also spend their winters in Arizona. He lived independently until he was 91 and then due to failing health, entered Deer Lodge (Chronic Care) where he was treated with great kindness and dignity. A private family Interment will be held in Pilot Mount, Manitoba at a later date. Wojcik’s Funeral Chapels & Crematoriums, Winnipeg, 1020 Main Street.